I’ll do it for Dee. I can’t fail, or falter nor give up this ride. I won’t quit or stop, nor forget why I’m here. I’ll get to the end, no matter the cost. Thank you all for reading, donating and keeping our spirits up. We all did it for Dee. 27th July – 4th August 2012. 9 days, 1000 miles. 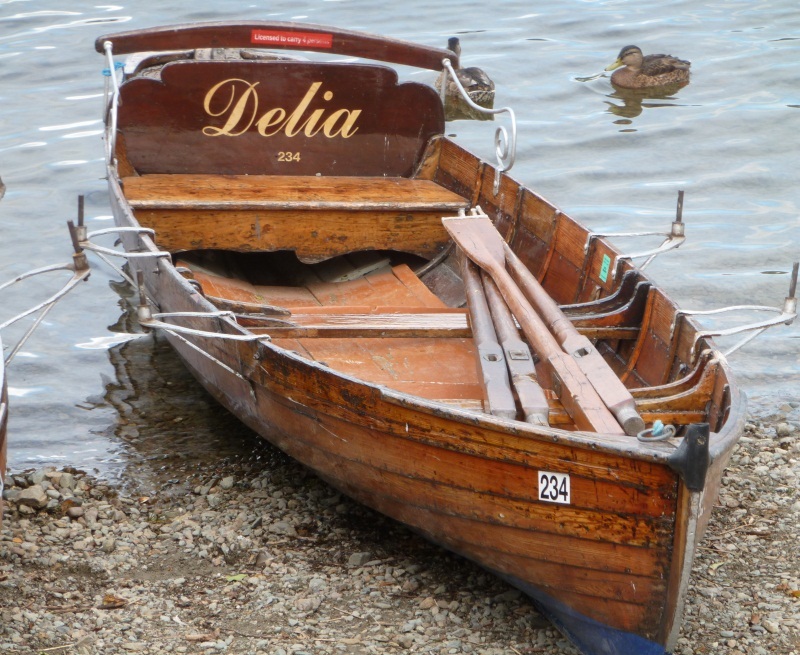 Dedicated to the memory of Delia Catherine Thompson, nee McGivern. 17th June 1974 – 14th August 2011. Our cunningly arranged early breakfast was somewhat spoiled by there also being a similarly early one organised for a bus load of tourists. Never mind, at least we had a ring-fenced pot of porridge only for our group. Van loaded, bikes quickly cleaned up and eventually we hit the road. The sun trap that was the hotel car park lulled us in to thinking there was fine weather ahead, but the haugh was rolling in over Loch Ness and the air chilly as a result. We powered along the loch-side, sun now coming out, for a rendezvous with my brother Dominic, astride a mountain bike that had seen better days – slurry lubricant on the chain was the teams’ best guess. 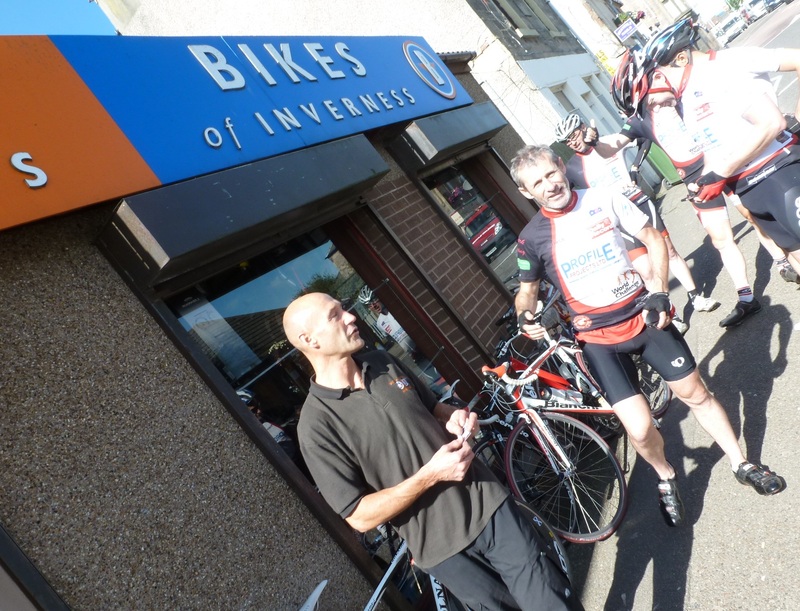 We headed slightly off-route, using Dom’s local knowledge to get to a decent bike shop for a fix for Mark’s front mech’ – Jerry from Bikes of Inverness to the rescue and we were soon back on the road. Leaving the city, we made our way towards Beauly then on to Muir of Ord, meeting the van for a fuel stop. Dominic turned back at this point (Olympics telly to catch up on), around 15 miles done with us (and another 15 into the wind and uphill to get home). On we went passing Conon Bridge, through Dingwall, a slight mismatch between mine and Sam’s Garmins causing a bit of a stir before ‘this way is north’ lead us on to Evanton and towards Alness. I reckon its this way? 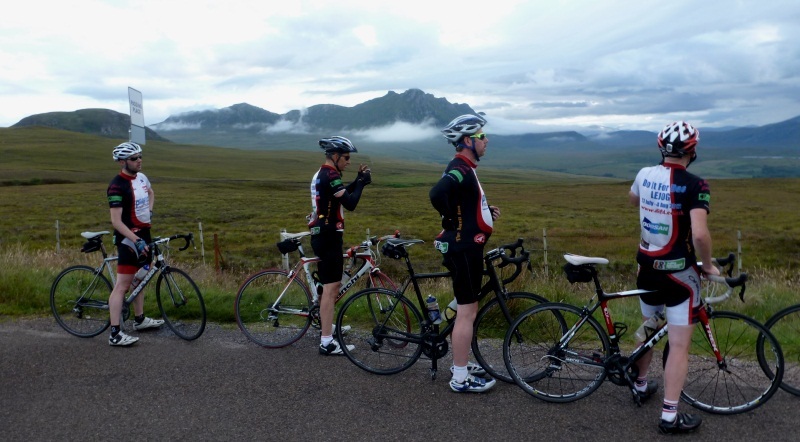 A brief stint on the A9 came to a welcome end as we turned off on to the B9176 and a great climb up and over Struie hill – fantastic scenery, views and not a bad hill to cycle up – just a slow, steady incline with very little harsh gradients. We soon reached the top, and after a brief stop at the view-point, headed down, a glorious descent, passing through Ardgay before meeting Cameron and Mark in Bonar Bridge for lunch. Bridge Burgers and macaroni cheese and perhaps the odd pint were consumed, bought from the pub where a local lad Ben threw us a few quid for the charity (thanks!). Just before we were to leave for lunch, a Canadian couple, tour-cycling asked about a local bike shop (none for miles) as they’d no spare tubes. 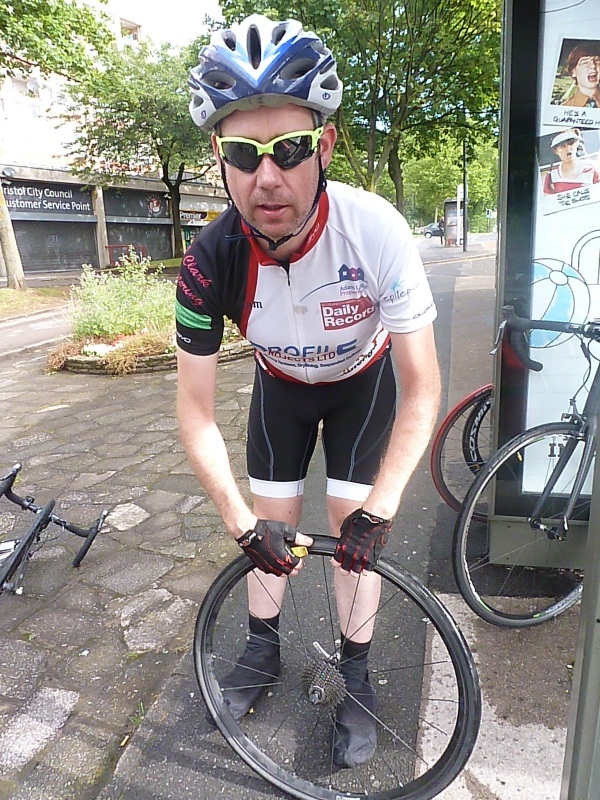 We gave them a couple, Michael assuing them that the thinner road tubes would be ok in their slightly wider tyres. 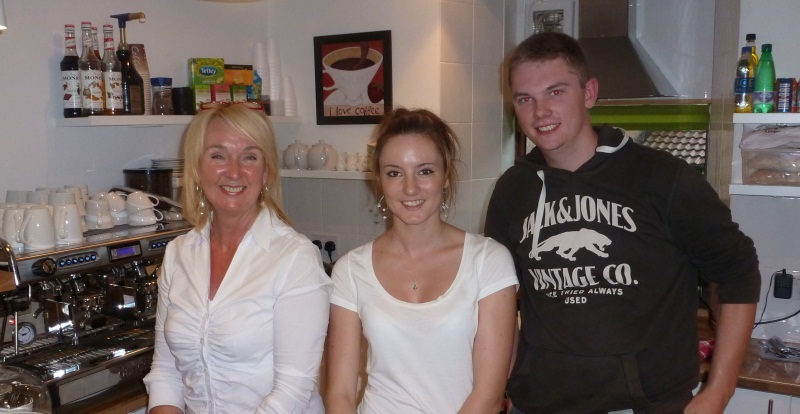 As a thanks, they donated to our charity (thanks Paul & your wife – we didn’t catch her name). 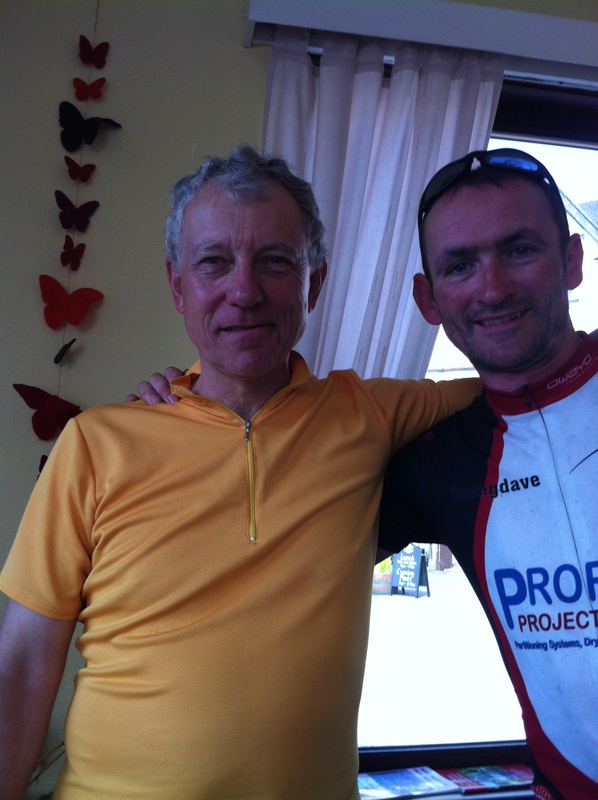 Canadian Paul – top bloke and fellow cyclist with our Davo. Off we went, Inveran and Invershin, another climb through to Lairg an then Altnaharra, now on single-track roads, stopping for our final refuel at the Crask (?) Inn, fellow cyclists Ally from Skye and Axel from Germany applauding from the beer garden as we pulled up. We chatted briefly before starting of on the final 20 or so miles between us and the end, the wind in our faces. We dug in, switching to single file to minimise the work as we made our way up and down the seemingly endless hills before us. the top at last. And no, I didn’t just fall off my bike as I rolled up to take this shot. That’s just a wicked rumour spread by the other guys. At the top of the final hill, we stopped to take some photos, the clouds hanging low over the distant mountains. We rolled down the hill to meet the van, Tongue barely a mile away, to be told the hostel was not up to scratch, so a quick negotiation was made by Mark with a local B&B and we were sorted. Day 8 done. 113 miles done. A fine nights sleep in the hostel for some, a night in the van for David (snoring avoidance) and a slight change to our routine to become more efficient (and to fit in with hostel breakfast-time policy) by packing the van first, then eating breakfast. Today we were met by Epilepsy Scotland’s Robyn, a companion via email over the last few months, to see us off in person. The swarming midges outside forced us inside for a few quick photos, but not before we were their breakfast. Robyn headed off, we got on the road soon after, a few of us circling round the hostel driveway in a vain attempt to avoid being bitten while the last few folk pumped tyres or grabbed essentials from the van. 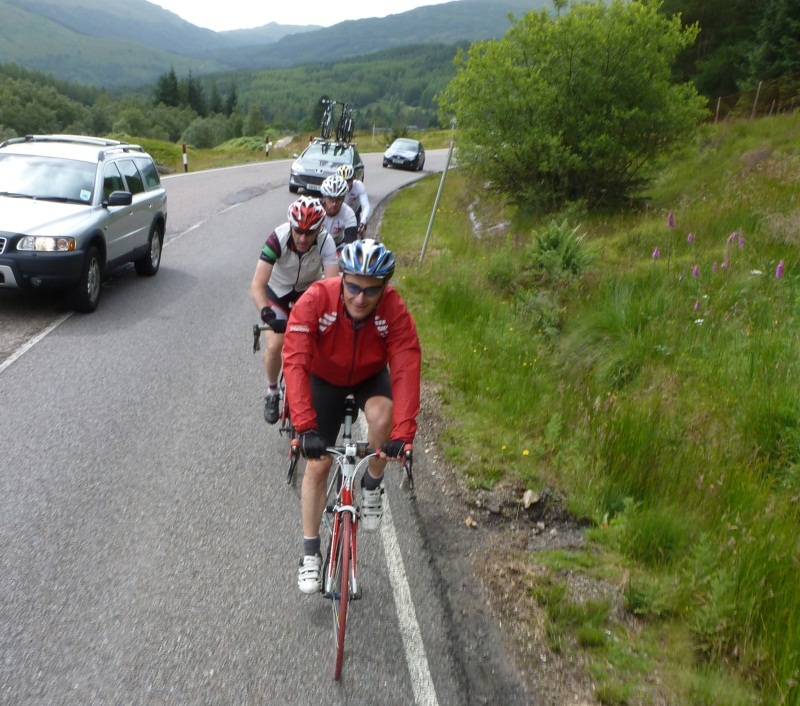 We hit the A82 with our new domestique, Michael M, fresh from a 36 mile cycle to meet up with us. Sam took the lead as we single-filed it along the busy road at an easy pace, taking in the miles as the day started with sunshine looking likely. We’d not gone far when the first incient of the day was to occur. Moving out slightly to avoid the bulging cats-eyes at a parking spot, front-man Sam was cycling towards a large crow , which appeared to be resting on the road – normally such beasts will quickly fly out of the way, but this one seemd to have a grudge of some sort and barrelled into him instead of flying in the other direction. Bouncing off Sam, it hit the deck, and the following train took evasive manouvres, narrowly missing it. As we moved on, comments flew forward – “you pull that out of your pocket to throw at us Sam?”, “hmm, does that mean I’m the only one to have pulled a bird on this trip?” came the reply. Onwards. Next issue – stopping at a contraflow there was a bang, this time Sam’s rear was flat. Gio ran a quick recce, and reckoned nipping through the lights, we could perform bike surgery on the coned off side of the road. He and Sam went to work, fixing the tyre and we were on our way. The road was damp, but the occaisional splash of water couldn’t change the fact that the weather was turning out to be near prefect for cycling. 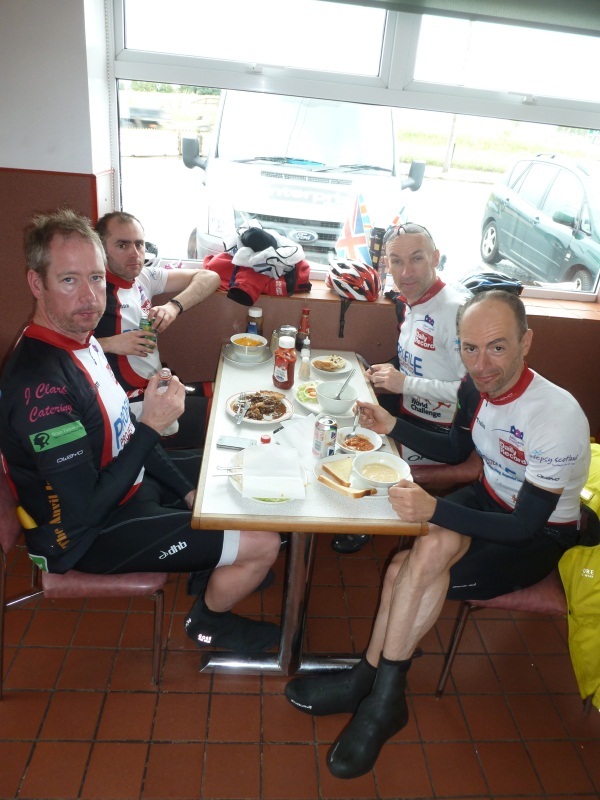 Next stop – second breakfast (or first lunch) at the Green Welly Shop at Tyndrum, where we ran in to some JOGLE cyclists (North to South). 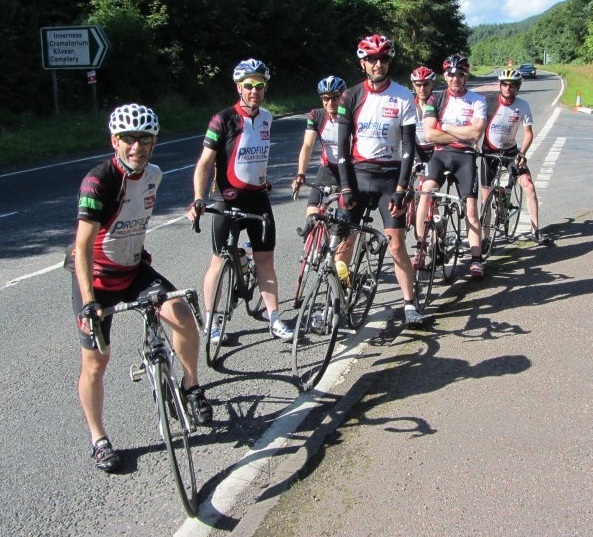 Nice lads from Devon, raising money for Macmillan – we exchanged a few cycling pleasantries, swapped tales of each others road ahead and got Cameron to take a quick set of piccies. Scones, soup and various other cakey consumed, we got back on the bikes and on up the hill beyond to Rannoch Moor. The climb was taken easily (big ring not quite all round), the occasional passing car or parked up tourist cheering us on. Once at the top, just as we were going to start our descent into Glen Coe, Sam’s rear tube went bang again. Repair, this time replacing the (torn it was discovered) tyre. Just as the repairs were done, a large squad of Hummersknott CC, also on a LEJOG, pulled up alongside us. Hello’s and chit-chat ensued before we all moved on downhill, DIFDers nipping by the ‘knott guys and gals on the descent – we were in more of a hurry than them, covering a few more miles per day. 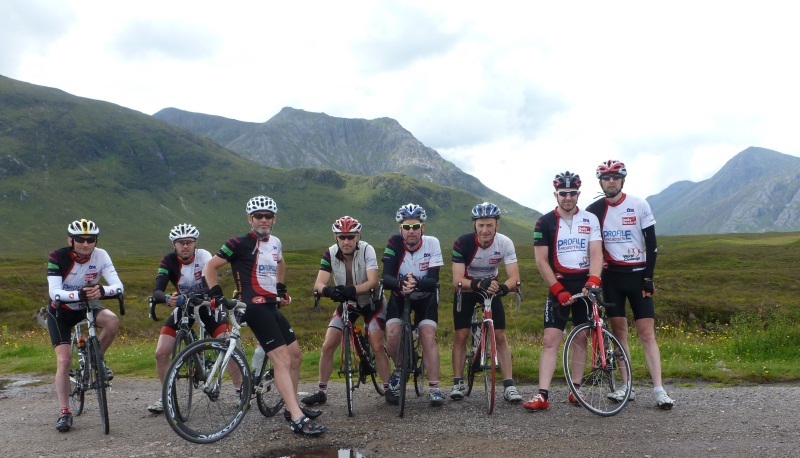 Our next target – Fort William, and second lunch. The promise of a fine feast lay ahead of us – Cameron’s sister Isobel had agreed to feed and water us, and we soon arrived to an excellent spread of sarnies, cakes & pancakes which was scoffed down in short measure “the best lunch we’ve had” – many thanks Isobel. 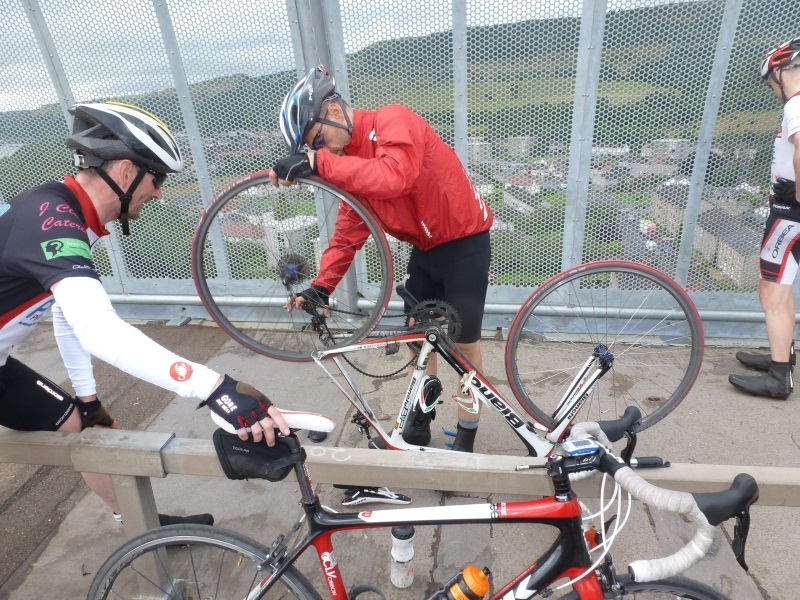 Off we set – well, nearly, Big J had a front puncture. Fixed in quick time, we headed off for the last 50 miles of the day, revived from our hefty sandwich consumption. A brief stop at the Commando memorial was our only pause as we piled on to the last planned van meet-up at Fort Augustus. A quick cakey break and back in the saddle, the realisation that we were running behind resulting in a blistering pace being set – the team stepped up and everyone took their turn at the front, the switches smooth and methodical allowing us all to work the train along at 20mph+ on the flats and lesser hills. We covered the last 20 miles in under the hour to be met by friends and family in the hotel car park. Day 7 done. 135 miles (171 for Michael!). Day 5. The day that would see us hitting the overall halfway marker at just shy of 500 miles. As usual a target time of early o’clock was planned, and as usual we didn’t get going for a good 30-40 minutes later. Never mind, Today we had Mark D joining us – a keen cyclist and for the next couple of days a ‘domestique’ for the team (in pro teams the domestiques help the ‘top’ rider win the race by drafting them and generally doing the work). 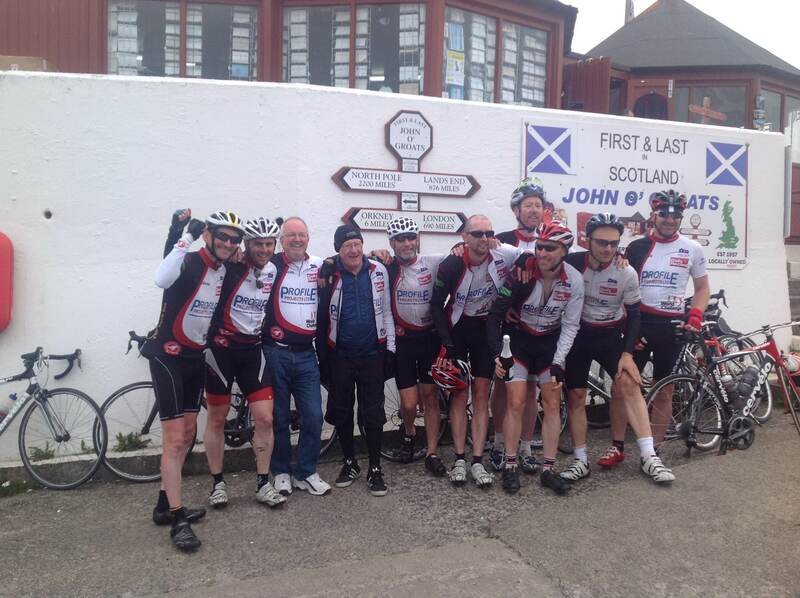 We set off in high spirits, the previous days 140 miles seeming to not have had any major effects on the group, except for a few aching limbs, par for the course on this LEJOG. Our route out of Lancaster took us down some quiet country roads, Mark D earning his place leading the pack for the most part and before long we were passing Kendal and heading into the Lakes proper, climbing as we went. This constant climbing was soon met with our reward, a long descent into Ambleside. A stop was called, ice cream, photos and toilet break taken. The road onward soon began to rise again, the toughest climb of the day on which we were joined by a local mountain biker. Everyone made it up without too much trouble, and the descent into Keswick was a joy, fast downhill and easy bends allowing us to pick up terrific speeds as we went. The van was parked up in a pub just outside of town, and we screeched to a stop to decide our next move (lunch). Some quick tinkering was required, so a visit to the local bike shop was first, then lunch in a pub (baguettes or baked potatoes all round), some cakey and then a return to the van (now parked at the Pencil Museum (oh if only we had time to visit) to resupply. 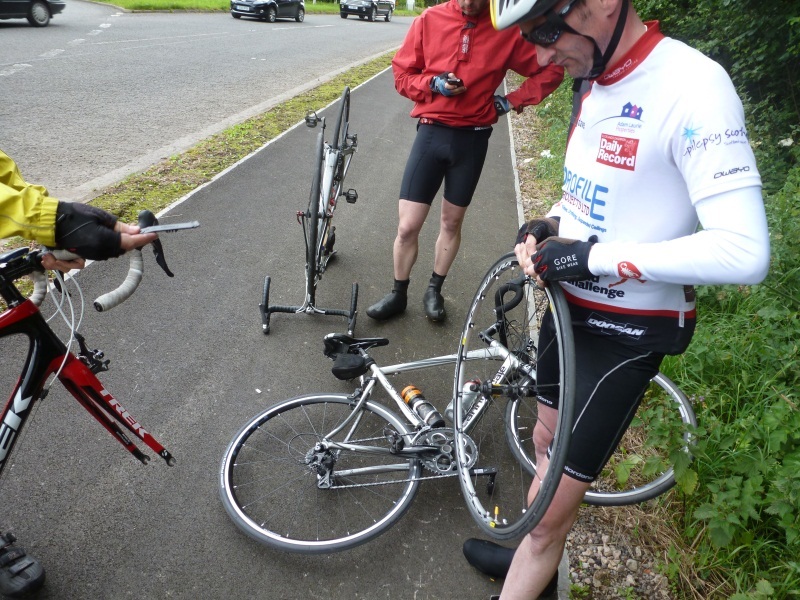 Half a mile up the road and a bang signalle d a puncture – Big J’s front, again. A failed tyre wall, so a quick swap of tyre and tube. Well, quickish. Off we went again, target Carlisle, making excellent time on the A591, minor detour off to catch the planned route (Garmin arguments again) but eventually arriving in roughly the right spot. A decision to keep rolling to Gretna unless we rode by a coffee and cake shop kept us moving through the town, a maniac in a white van the only incident of note – impatient with the black car ahead of him, behind us, he undercut us all at set of lights in a left only lane, nearly taking Gio out, leading to an exchange of colourful language. Deciding not to give chase, we let the idiot go, the couple in the black car amazed as we were at the van drivers actions. On we rode, again on quieter roads, I was in the lead position when a tractor pulling a massive trailer squeezed by me. Bus-chaser Daly let out a cry to draft it, and the whole team burst into action, tagging on to the vehicle and getting an amazing tow. 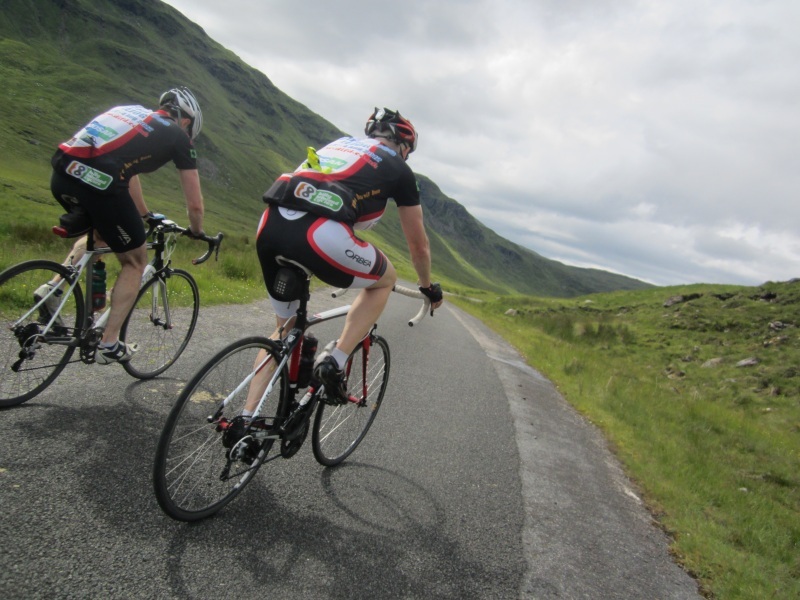 For a half dozen or more miles we hung on to his tail, topping 30mph on the flat and 27+ on the upward hills – “dig in lads” was the cry as the road rose, no-one wanting to drop off the free ride we were getting as to do so would mean quickly being left behind. 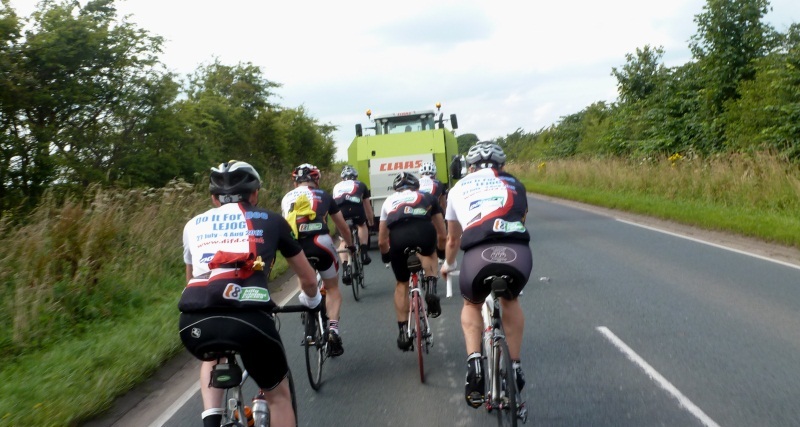 On we hung into Longtown, locals looking on in bemusement as 8 cyclists clung to the back of the agricultural behemoth. Sadlly we were to turn off, Young Davo declaring he’d have happily followed it all the way back to Land’s End. The path to Gretna was soon made, and the traditional End to Enders stop by the Welcome to Scotland sign was made. 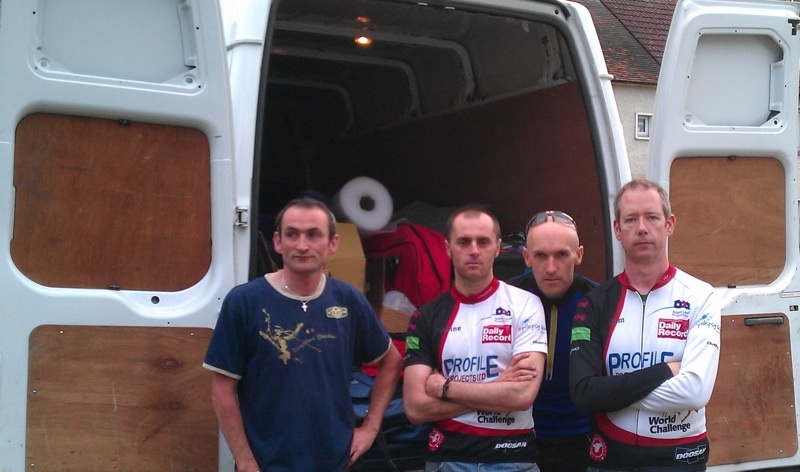 A quick (by our standards) van restock made, we piled on to the last 20 miles to the end of todays route. Travelling 2 up, we made excellent time, swapping a few at the front along with the tireless Mark to drag everyone home up the last couple of hills before a welcome final downard run into Lockerbie and the hotel. Day 5 done. 114-ish miles out of the way. 140 miles in one day. 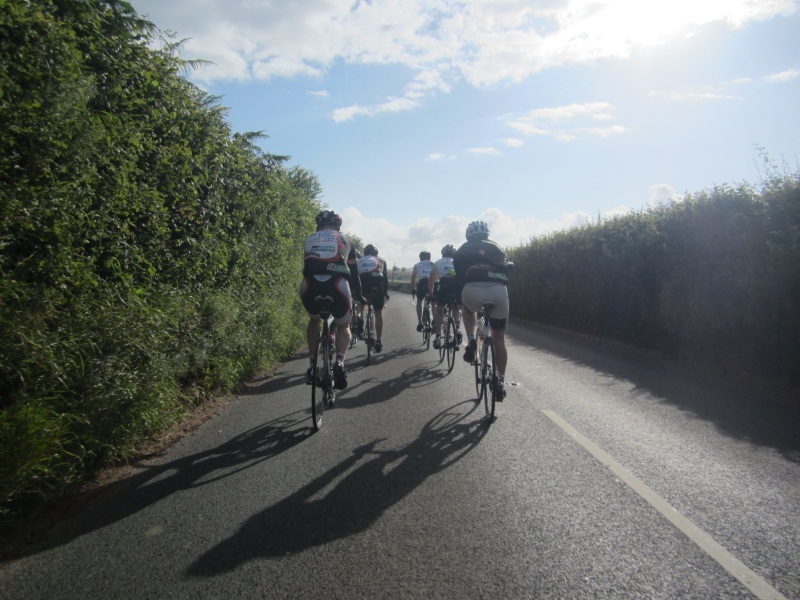 Seemed like a bit of a mix of crazy idea and sound plan – its the longest ride any of us have ever done, but the profile (not many hills) allowed for a good combination of distance without over-taxing us. So off we headed. Well, we got to the edge of the hotel car park and Big J had a front flat. Sam had headed off to a nearby hill to take a few shots as the rest of us arrived, so I went on to let him know there’d be a delay while the flat was changed. 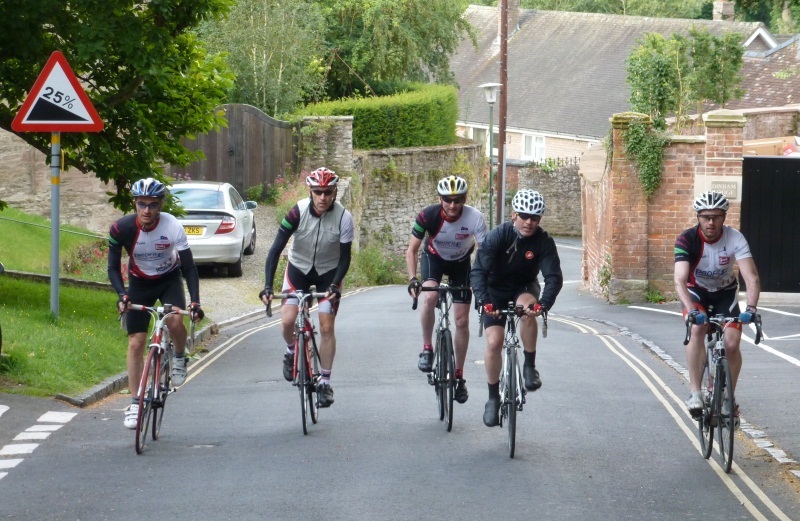 Half an hour later (or so it seemed) the rest of the team crested the hill and we moved out of Ludlow together, finding our way on the route to Lancaster many miles ahead. A brief stint on a main road was followed by several miles of winding country roads. The weather, starting bright, if a bit chilly, turned, and heavy showers began, much to the annoyance of a few of the team who had not remembered to pack any waterproofs. As we were on such small roads, a call to the support van wouldn’t get us far, so we just carried on (getting wet). We then hit the main road again, but before we’d got any distance David had a rear puncture. An excuse for a toilet break, puncture change turning into a tyre change (Gio was carrying a spare after yesterday’s tyre/ pucture issue) and a call to Cameron to order various bits from a bike shop (several spare tyres, arm warmers and a bottle cage). We got going again eventually, and headed along a busy A49. Not too far along, my Garmin declared a left turn, we we turned onto a quiet country lane, picturesque countryside, gravel strewn road. With a big 20% hill on it. Oops. Ah well, we’re all seasoned hill climbers these days so a little hill is no problem. Shame we still had over 120 miles to go. Hill climbed, discussion about where to go next (Garmins deciding we were no longer on the route) ensued, eventually working our way back to the main road. We’re not lost, Gary Garmin says its that way! This time we stuck to it, making our way to Warrington and ignore the beeps from the Garmin telling us we’d missed various turn offs (we hadnt). 11.30 and we’d covered just over 37 miles. We pulled over in a Morrisons car park, where coincidently Mark and Cameron had parked the van. A quick food stop (not so quick it turned out) to eat a quick sandwich and some cakey, bottle refill and then get on our way. This wasn’t lookng smart – miles to go, poor time made so far. However, the DIFD machine got into action properly, Sam taking the front and setting a great tempo picked up by the rest of us and soon the miles were flying by. One or two brief stops to allow the convoy of traffic tailing behind us (after a maniac lorry driver nearly took out a line of oncoming traffic when overtaking us) and soon we’d covered another 40 miles. Lunch stop 2 at a fine trucker’s cafe. More food, no cakey. Agreement with Cameron and Mark to see them in around 30 miles time and off we went. Again we set a solid pace, each man taking his turn at the head of the train, as we powered on, everyone seeming to have boundless energy. We barely dropped pace except for the occasional hill which momentarily damped the pace, before the inevitable downhill speed up to get us back in the swing. We soon arrived at the 30 mile marker (107 done, 33 to go), Cameron and Mark picking the car park of a bike shop to stop the van and meet us. 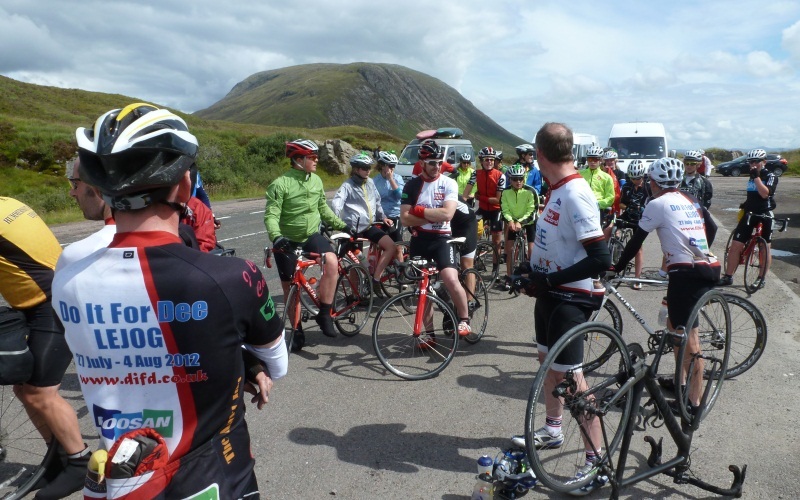 We wheeled in to the car park, and folk began to refill bottles and restock on gels and snacks. I nipped in to the shop, picking up some arm warmers and new cleats for my shoes (the bit that sticks to the pedals). A few minutes later we were back on the road, the last 30 miles or so and we’d be done. The team kept up the momentum of the previous sessions, working well for the most part, some close calls with traffic on round-a-bouts and at the lights, but otherwise uneventful. Until around 10 miles to go, when an unspoken message seemed to ripple through the group and the pace began to pick up. A favourable wind was equalled by flattish terrain allowing us to (perhaps we’ll regret this in the morning) maintain a terrific pace, the last miles flying by as we pushed on and on. 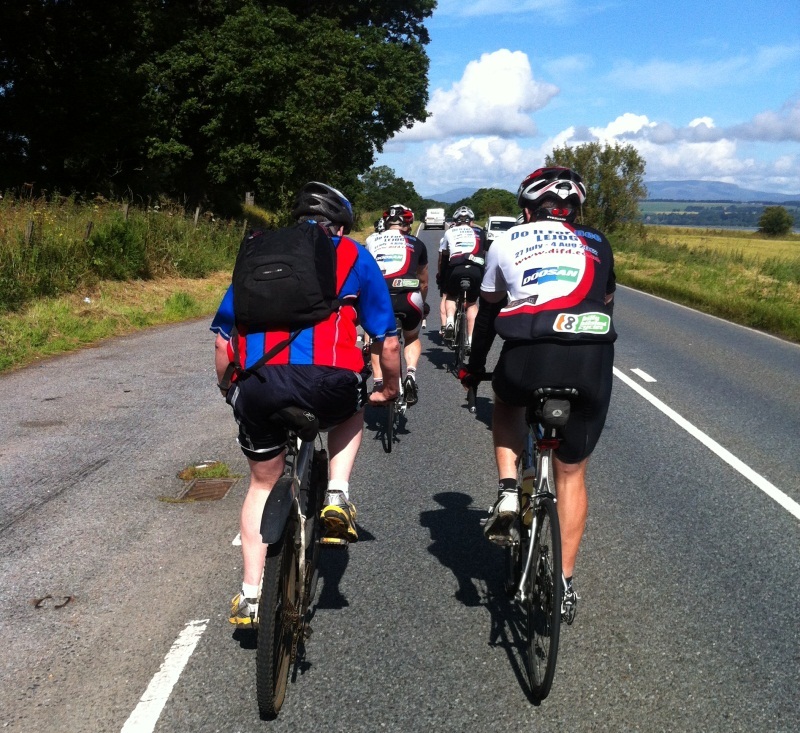 We soon entered Lancaster, the pace not slacking, rather seeming to pick up as everyone took their stint at the front. A stop was called barely a mile from home for a photo op, then it was back on the bikes and we rolled in to the Holiday Inn car park. Done. 140 miles. Everyone intact. No complementary wifi in the hotel. Meanies. This will have to be posted during day 5. Sorry folks for the delay particularly to our biggeset fan, Fino – he’s just read all of our blog posts since the start in one sitting, and can’t wait for more! 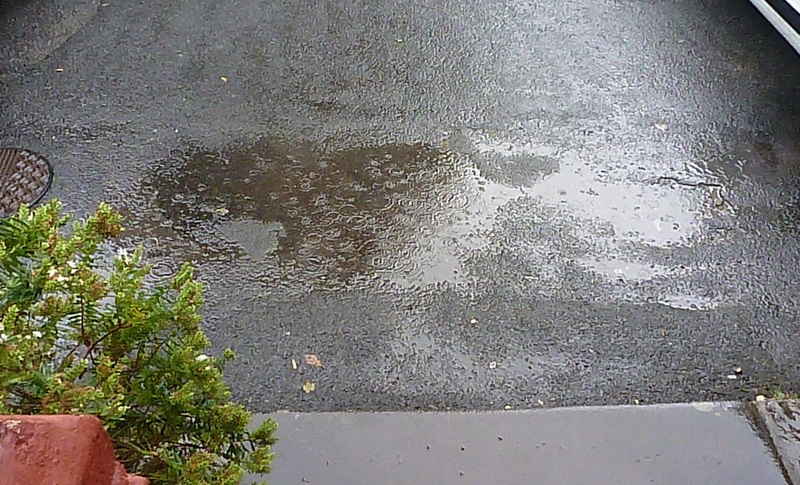 I wake up early to the sound of snoring but also to the sound of rain battering the window. Not a good start. I try for a while to get back to sleep but it’s not happening, and shortly my room mates Big J and David are also awake. The legs were definitely not as fresh as they have been the previous couple of days and the rain certainly didnt set the heart a flutter. The plan was to get the bags in the van before 7 and then breakfast. 7 comes and there is some activity but maybe not quite the level expected. Some of the bags are loaded in but it’s a difficult job as you dont want to get soaked before you even start. So it’s a case of darting in and out of the hotel and chucking stuff in. I wander into breakfast with my porridge pot and only Ian is there with his cornflakes and we have a chat about the day ahead. Slowly everyone wanders in and the full compliment is there. Up until now no cooked breakfast is available but the hotel have kindly changed their weekend breakfast time to accommodate us and is would be rude not to take the hospitality. The popular option seems to be beans on toast, still erring on the side of health. Although this choice has it’s drawbacks.. The enthusiasm levels are high but no one really like to start cycling when it’s wet, it’s doesn’t seems as bad when you are already going but with 100 miles to get through the call goes up to get moving. First thing to do, get the wet weather gear on. Jackets, hats and overshoes to keep the feet dry. 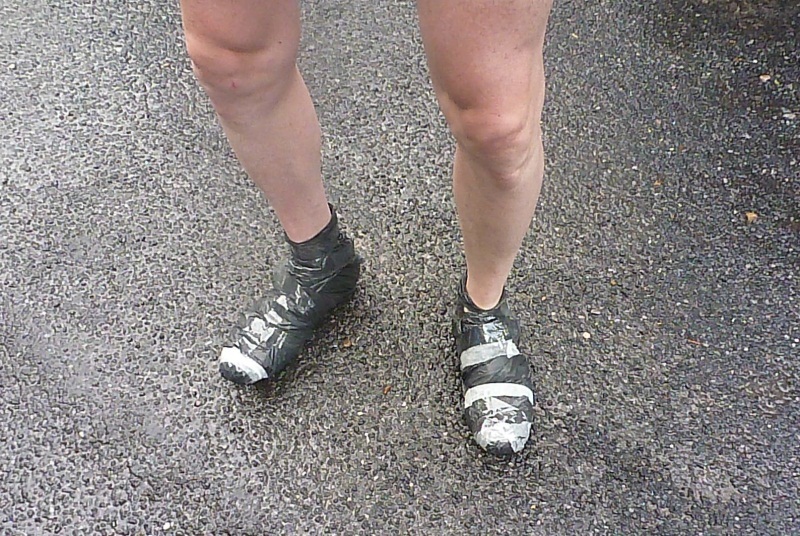 David who in his own words ‘can make anything’ is put to the test as he has forgotten his overshoes and decides to build some out of bin bags and sellotape. Mmmm time will tell if they will take off in the shops. In all good sport shops soon! Finally, the van is packed. There is no real system, more dog eat dog to obtain the best space for accessing your stuff when you need it. However, no matter how carefully you put something in, somebody is likely to chuck it to the bag and steal your prime spot. At about 0830 we eventually roll out of the hotel and onto the road heading toward and through Bristol. Unfortunately, the biggest hill of the day comes in the first 5 miles. Not big by Alpine standards, but big enough to push my heart rate way up and give my leg a workout. Is this an omen for the day ahead or just not enough of a warm up? The miles start to roll by and we head into Bristol, it’s quiet but the lights are a pain. It’s stop/start and you are constantly clicking in and out of your shoes. One of my shoes has a problem clipping in, and it’s always a job to get good start at the lights without holding up the cars. Moving through Bristol we hit our first puncture of the holiday, David back tyre instantly deflating. The team are quickly on the job though with Gio and Sammy leading the way. Not exactly a Formula 1 change but pretty good one the less. We don’t even have to blow the tyre up, instead we use a Co2 canister which takes all of 2 seconds. Handy! Off we go again, through Bristol with Mark trying to get some action shots. Soon though we leave Bristol but we are not in the idyllic countryside but on a major road with the rain still persisting it down but we are making progress. 25 miles in and the support van makes it’s first appearance of the day. It’s a welcome sight but there is a cloud on the horizon. The cakes kindly made by Mrs Sammy are running low and wont last the day, one of the highlights of the trip so far will be no more. There was almost an argument the previous day over someone slipping an extra slice into the back pocket. Unfortunately, as soon we leave the support van, we get another puncture, Mark this time. Not good. 27 miles in and it’s nearly 11:00. Our next arranged stop is Chicester 25 miles in. Time to get the heads down. To get us moving along, we resort to a long line of 7, each taking a shot of 0,5 miles at the front taking the wind before going to the back of the line and awaiting their next spell. The time passes quickly with this method and for me it’s all about calculating how many spells at the front before Chichester. 7 spells does not seem to be a large number of goes on the front so makes it my mind more manageable. Not sure how the others cope but for me breaking things into sections seems to lessen the trepidation of a long journey. We hit Chichester and as per usual get lost within the city streets and have to dig out all our various technological devices to find the right route..
It’s nearly 12:30 in Chichester but we decide to plough on a bit longer and make the afternoon shorter. We have sent the van on to scout out somewhere for lunch and about another 10 miles on we spot them parked beside a nice country pub. The pub is nice but whether it’s our appearance or the numbers but we are shunted into a marquee in the back, which looks as if a wedding had been held their the previous night. But we are happy, lots of space to move around. The food on offer today is a carvery which is remarkable value at only £5.95 and everyone gets wired in piling plates high with the serve your own Dauphinoise potatoes and veggies. All very nice but it’s going to be hard to get going again. Eventually we do get going, and fall into the same pattern as before. Ticking of the miles, the roads getting quieter as we head into the country, the pace is good but not crazy fast and we soon meet up with the support van for our afternoon check in. The final pieces of home made cake are handed out and we wonder how we will survive. Gio then discovers a puncture just as we are about to leave and this sets us back. The original plan was to swap out wheels if this happened but the spare wheel is somewhere in the back of the van so we decide just to fix it. We roll out again for the final 20 miles and it’s a gently uphill most of the way. We roll into Ludlow shortly at 17:00 and through the town to the hotel. We go down a 25% hill which we are going to have to go back up in the morning. Ouch. 100 miles done, spirits still good, no huffs lasting more than 5 minutes. Cant ask for more. 140 miles tomorrow, will we say the same then? 200 miles covered in two days. Surely the team must be flagging now? Let’s hear the words of wisdom from Turbine and, first, the words of not-so-much-wisdom from Young Dave. It should be noted that Young Dave was rather bereft of sleep here, due to the frequent gas leaks that emanated from the hotel room. 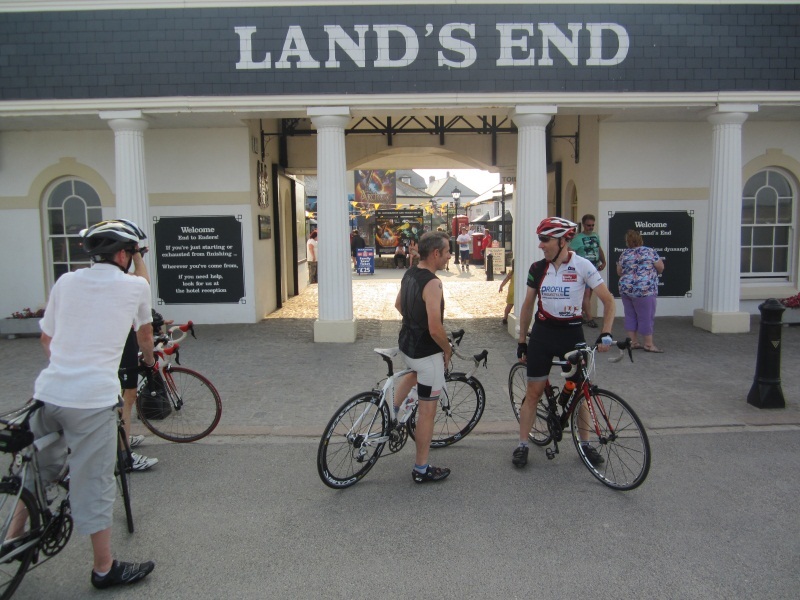 Tubs, Turbine, Ronnie Rocket or whatever monicker you know him by – the mouthpiece of each phase of the great Land’s End to John O’Groats challenge. Watch and see what the feeling was sitting in a fine Bed and Breakfast in Land’s End only minutes before the great adventure, so long in the planning, would start. 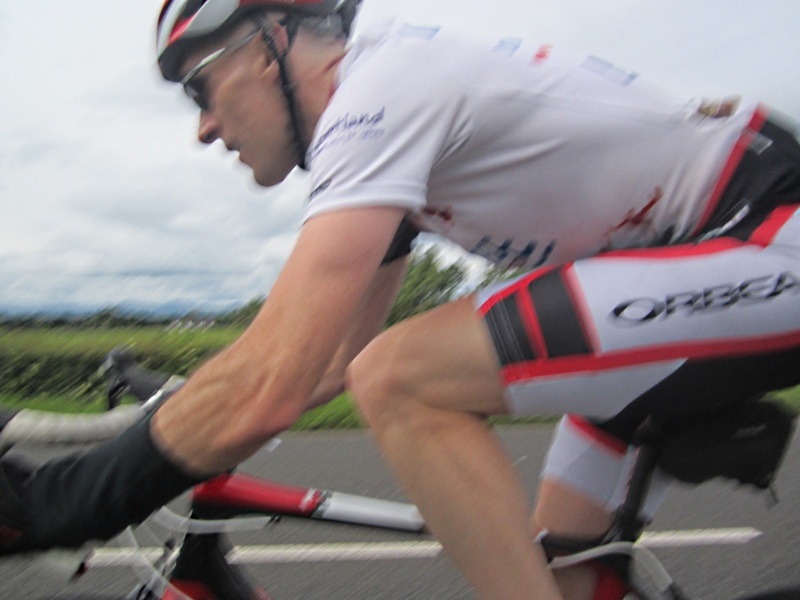 Post Ride Tubs comments – “This was a tough day, especially in the afternoon when we hit some big hills. Really enjoyable though. 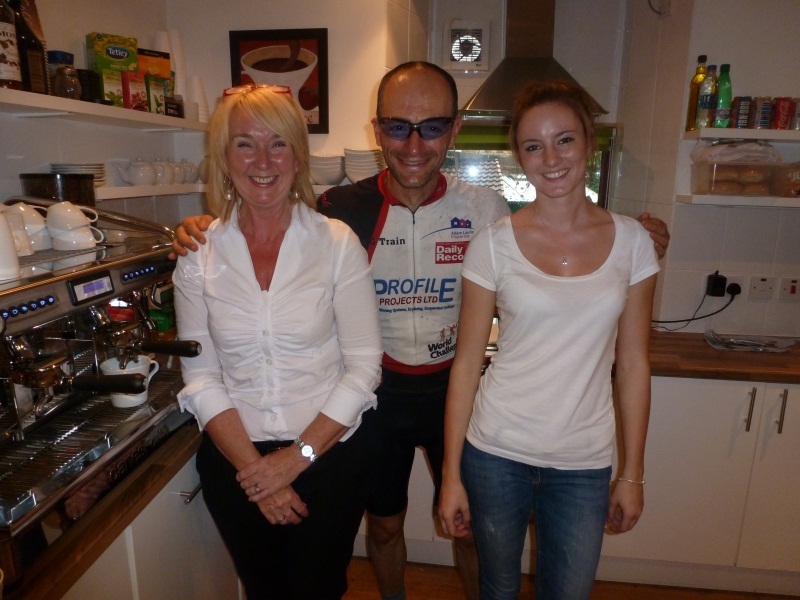 Missing from Ian’s blog was meeting the lovely couple from Solihull CC on their tandem the night before our LEJOG. Briefly caught sight of the chap next day post-lunch, but our peloton was in full flight and we didn’t get a chance to stop. All the best to you both”. Here Tubs tells us about what day 2 has in store. Day 2. 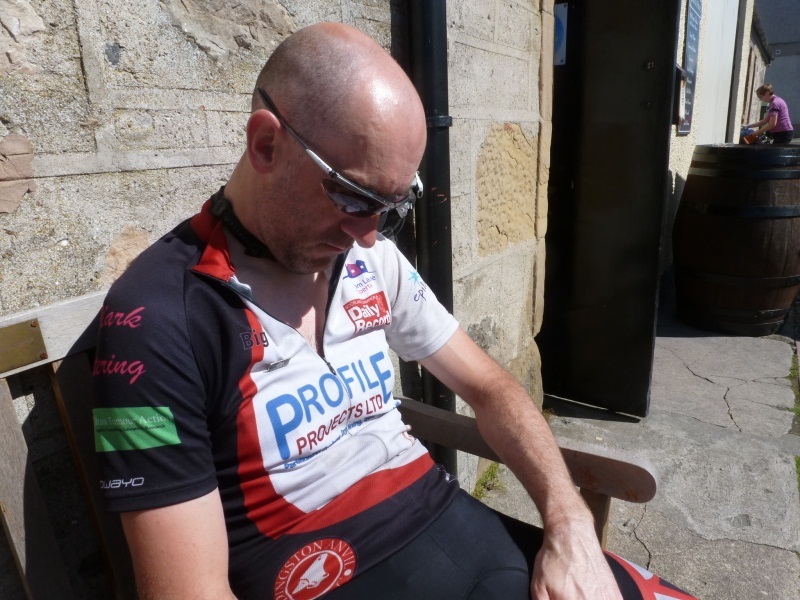 When it dawns on you that you’ve still got an awful long way to go and you don’t have a day off to recover from the 100+ miles of the previous day. Breakfast was quickly despatched, cereal, fruit and yoghurt for most. The van packed, last minute room checks, a swithering over whether to take or ‘call in the van’ for waterproofs and we were on the road at just after 7:45. The first section of road was flat, followed by a few smaller hills, where my chain locked up switching rings – a mechanical crunch which seemed to sort itself out, so on we went. A nice downhill, topping 40mph, followed by rolling hills allowing the team to work well in our mini-pelaton, passing a lone cyclist as we went. However, we soon hit a stop, my front derailleur had actually snapped in my chain crunching episode, so I was effectively stuck in the ‘big ring’ (the harder to pedal/ faster gears). This wasn’t a major issue, as the ‘profile’ for the day (essentially how the hills look) was showing a mostly flat day until the last few miles (big hill). This would allow us to stop at a bike shop around lunch for a fix. Nicely worked out. So off we went, making good time, pausing only if/when the GPS got confused and at Tiverton, just by the Whilrliwash for a van catch up and bottle fill and to phone ahead to a bike shop in Taunton to see if they could sort my bike. We set off, soon missing the intended route, heading along an unmapped road instead of the dual carriageway A38 – probably a fortunate error, avoiding the busier road. 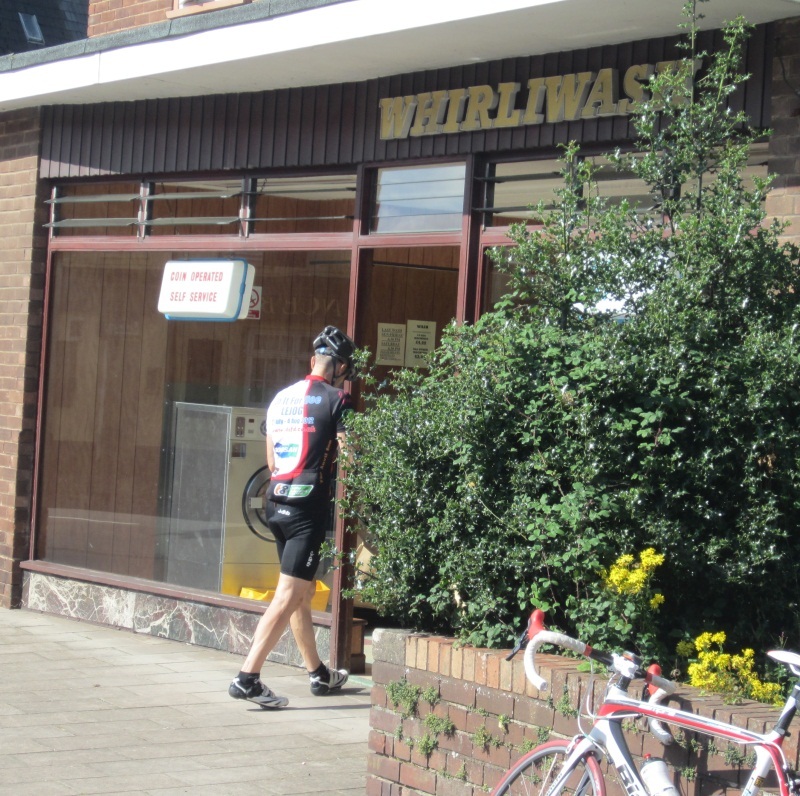 Taunton was reached, a phone call to Cameron and Mark to establish the location of the bike shop, and we headed over. The nice folk in the Bicycle Chain came up with a new part for my bike which they would fit while we went to the Kings Arms for lunch. A fast lunch watching a bit of Olympic telly – the road cycling naturally, and we returned to collect my bike, but not before a couple of folk in the pub donated to our charity – thanks Kit and Beverley! 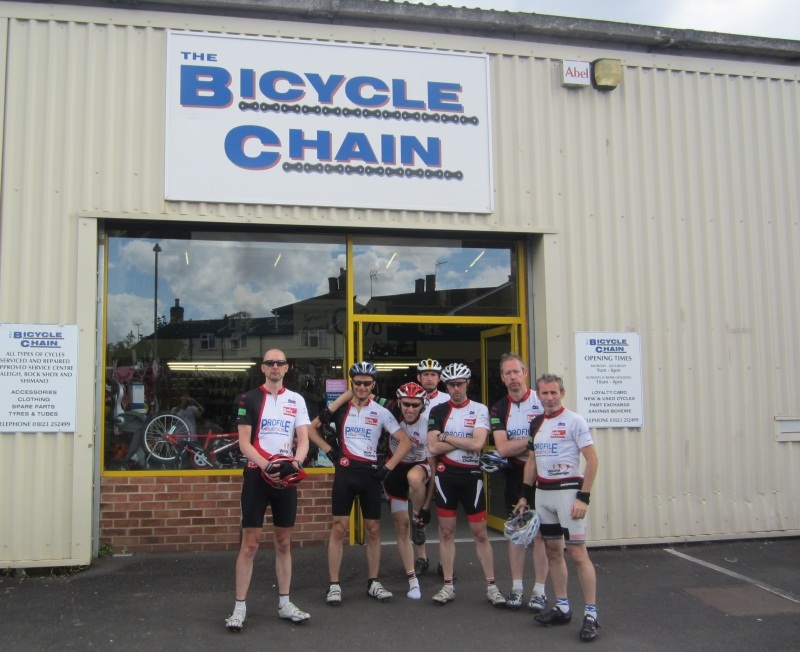 the Bicycle Chain – thanks Brian and Nick for sorting my bike! Bicycle Chain had sorted my bike – good as new (the part was new, cannabilised off another Canondale bike the same as mine), so off we went, taking the road to Bridgwater through heavy traffic. This turned into a serious jam, allowing us to overtake the cars, filtering our way carefully by the often stationary cars. Highbridge, Southwick, Wedmore were passed by, a brief van catch-up stop our only pause as we moved swiftly to Cheddar in the Mendips. 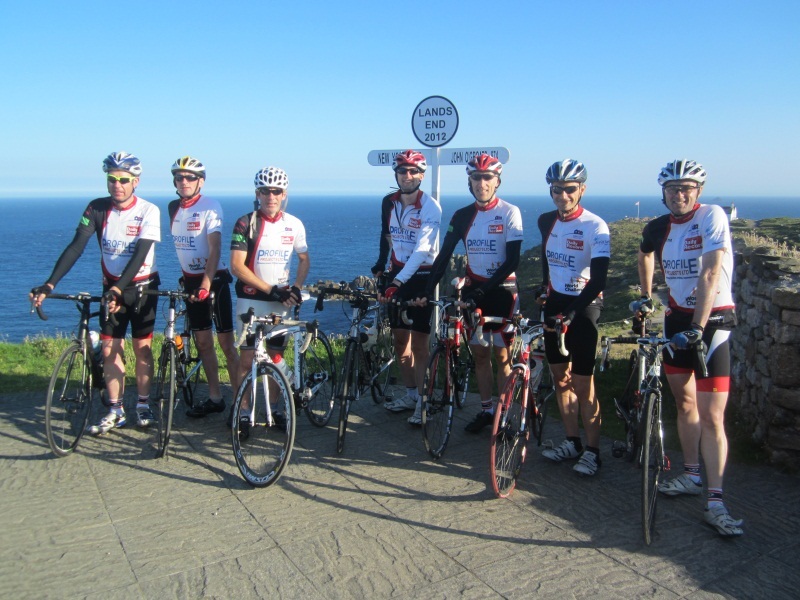 Here the road was to climb, steeply – our support team at the ready to grab a photo as we toiled up the steep incline, myself at the back, though barely a gap was between the team. Fortunately the severity of the hill did not last, and a gentler slope lay before us (and a queue of cars behind us) when we finally reached the top. And turned back, as we’d missed the turn off. A few more miles of confused GPS following, a run in with the van team to determine which way to go and we were soon flying down the hill to our accomodation for the night. But not before another “we’re lost” moment and about turn for the last couple of miles, finally reaching the Bristol Road and a beaming Cameron waving us in to the hotel carpark. Day 2 done. 102 miles. Best near-bonk moment of the day – Big J asking for a sweetie/ gel 400 yards from the hotel. Scariest moment of the day – numerous run ins with oncoming traffic on narrow roads and in the traffic jam, especially a bus or two. 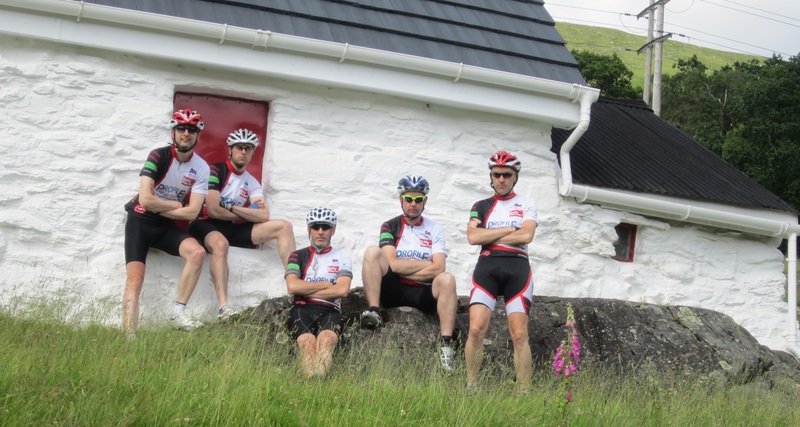 the Reservoir cyclists – who wants to be Mr Pink? The first day of actual cycling was preceeded by the night of a thousand squeaks – the hostel bunks had the charming feature of making a terrible racket every time you made any movement. Result – not a very good nights kip for many of us. Still, up at 6-ish, showered (optional), breakfasted, bottles filled and some last minute mechanical tweaks before heading down the 3/4 mile to the ‘start’ at Land’s End. The sign, the bikes, the riders. John, Sam and I filled in the ‘End to Enders’ book in the hotel, then a series of photos at “The Sign” for the whole team. Then to the ‘start line’ – yup, there is an ‘official’ start line painted on the road. Striking a quick pose for camerman Cameron and we were off. Problem #1. We’ve only ever ridden as a group of 7 once, months ago, so the ‘system’ we regularly use to change the ‘man at the front’ which works fine for a single file line of 3-5 folk wasnt really going to cut it with the ‘peleton’. Three systems came into play, which made for a fun few rotations while we worked out what was what. Eventually we got into a rhythm, merged the 3 into 1 system, and the DIFD train was 2 abreast and working well, swapping the lead pair every mile or so. 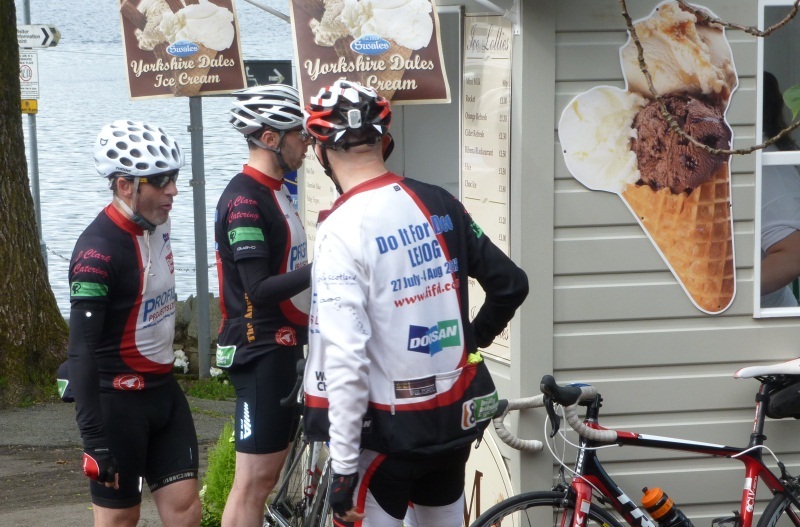 On we went, taking it reasonably easy, aiming for our first break (and potential cakey stop!) at Redruth. Mark was having some problems with his gears, so a quick stop at a bike shop (no use it turns out) meant we missed the van rendezvous. 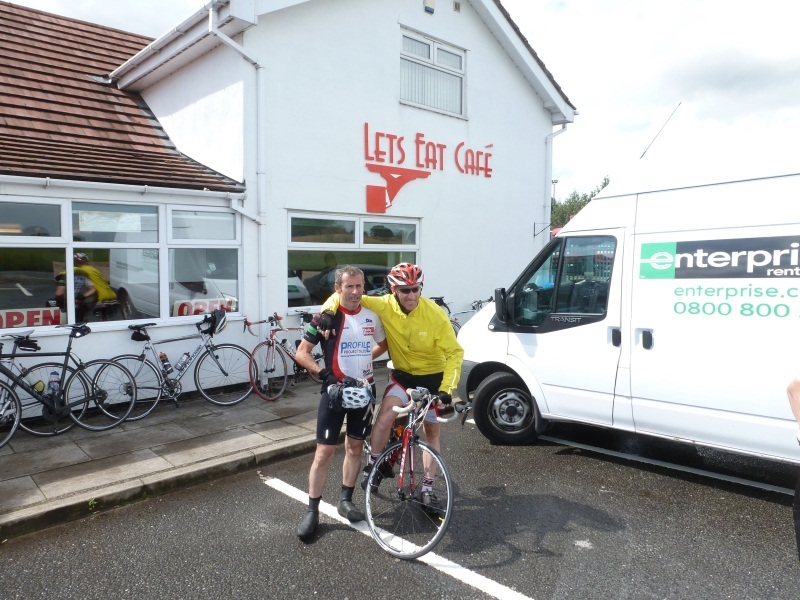 A phone call re-arranged a layby stop – van, cake, bananas and water refills. On we went, toiling up a hill or two, making good time and only having to play with the traffic a few times on the busier parts of the A30. A silver van tried to take us out, but missed us all as he zoomed by, giving us at least 3 inches of room (why would we need more?) and nearly causing a peleton pile-up. 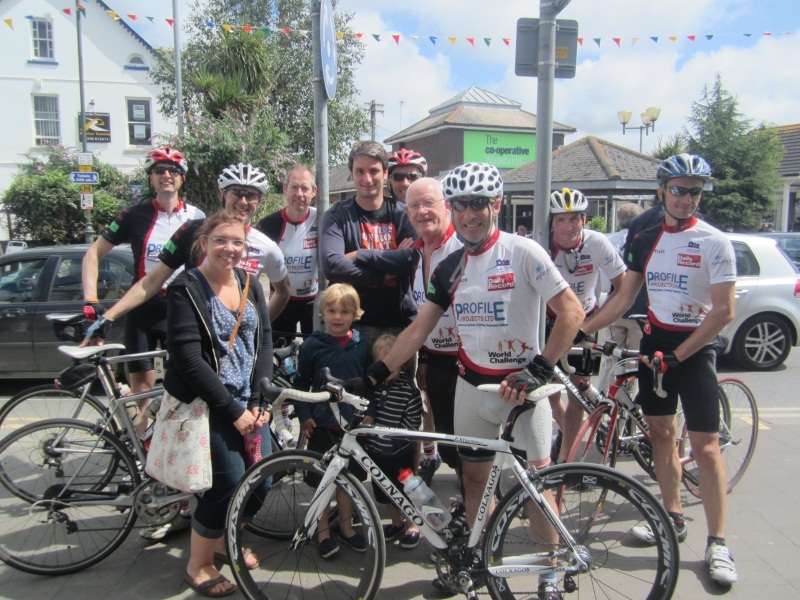 Target 2 – lunch at Wadebridge (60 miles) and rendezvous with McGivern cousins Gary & Claire. The only issue between us and there/ them, the haybale challenge. 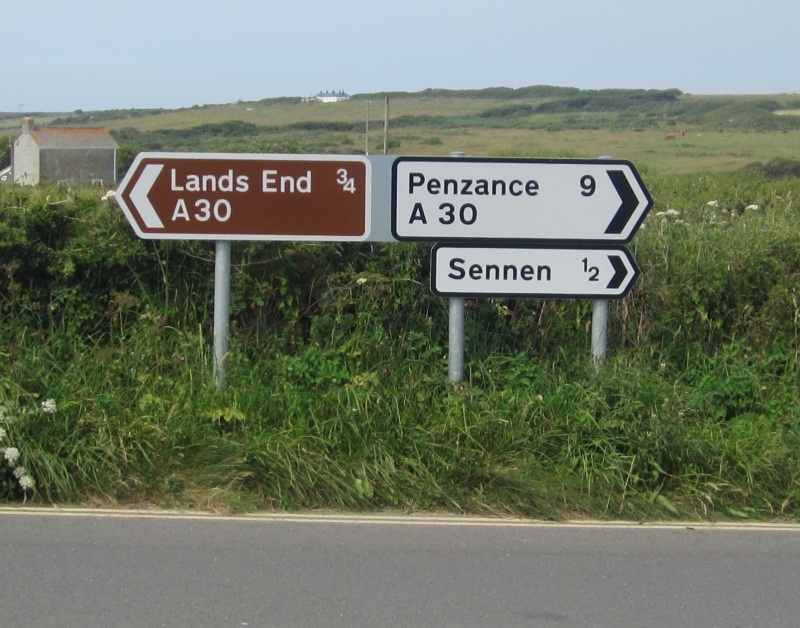 It must be some new Cornish cycling test. 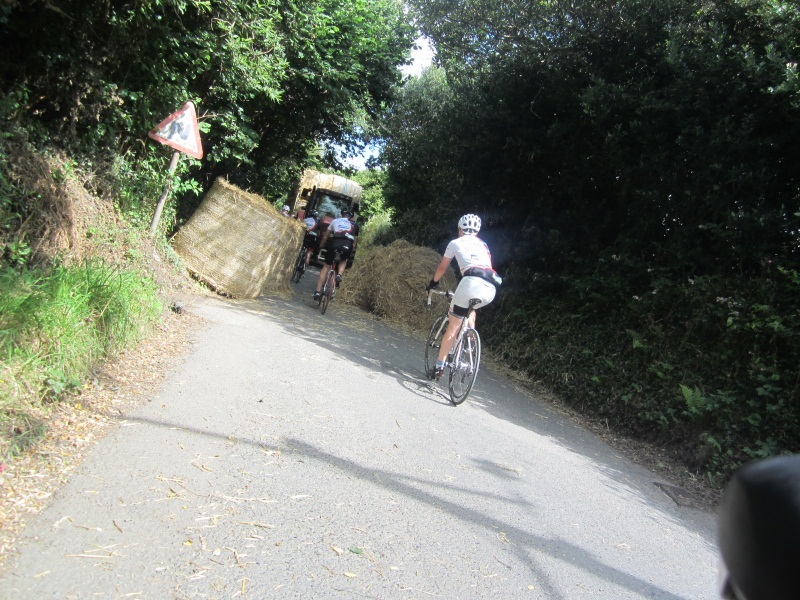 Local farmers block the road with haybales and us cyclists need to negotiate the resulting slalom to prove we are true masters of the bike. 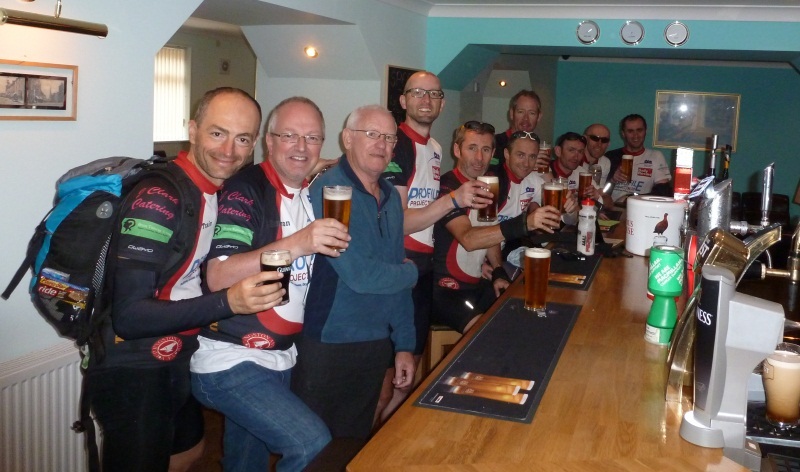 Slalom test passed, we arrived in Wadebridge, located pub, van support, cousins and something solid to lock 7 bikes to. 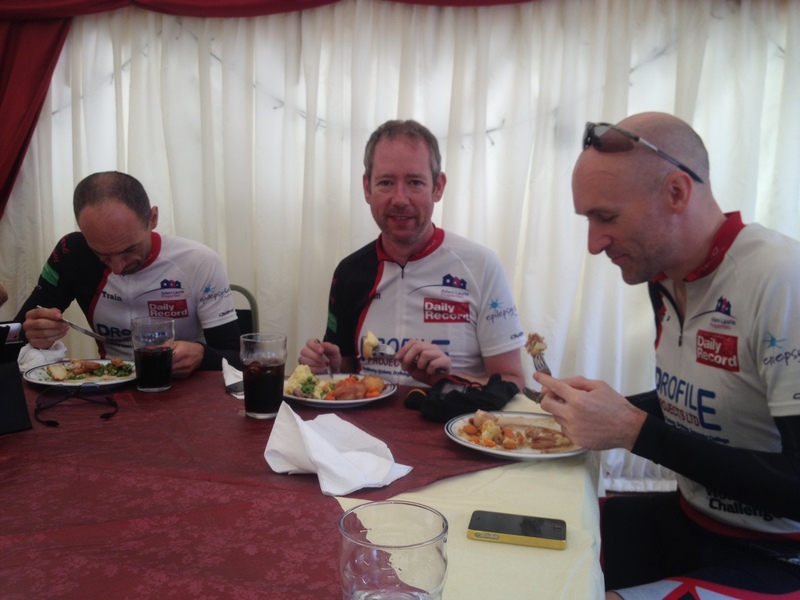 Lunch demolished in quick time (for those that got it on first order, something of a wait for tables 2 and 3), chat with one and all, then we were back on the road for the last 40 miles. Should be easy enough but for problem #2 – the bikeroutetoaster courses and Sam’s and my Garmins were not playing nice, making dealing with route and direction changes ‘fun’ – wrong turns and roads aplenty. Still we got the right one eventually, only to discover problem #3 – the last 40 miles (no problem) contained 2 hefty hills (potential problem). 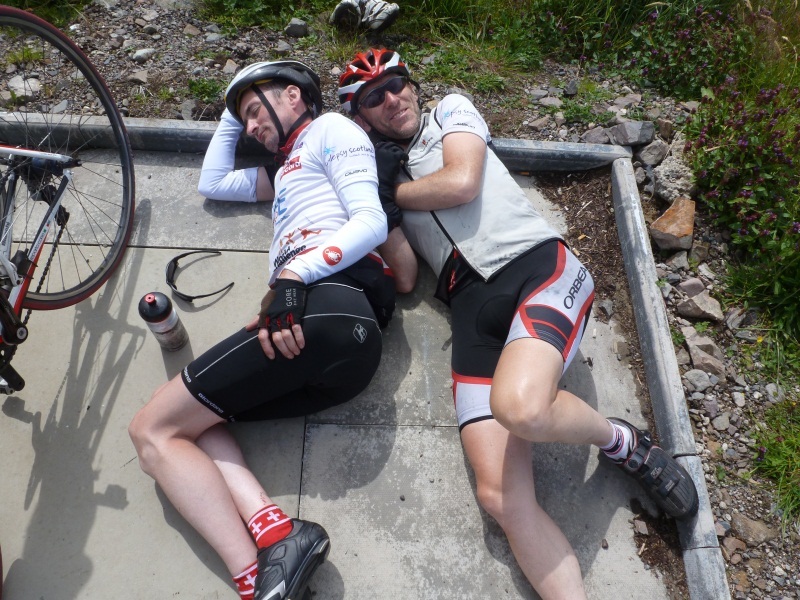 So far Cornwall hadn’t quite presented the 25% inclines we’d anticipated and in the end nor really did these two. We took the first at pace, a long gradual ascent rather than a torturous steep affair, the team now well used to such challenges. In between this and the next, a road with new ‘loose chippings’. Or, in my humble opinion, a pile of gravel threatening to have you off the bike if you dared to move at any pace, pretending to be a road. For miles. And up hill, making it even more fun. In the end, no issues, but a nervous few miles. The last hill took its first victim – Bryan going for the cadence record of the day, as his chain jumped off the sprockets, me narrowly missing running right into his back wheel. A short stop to fix his chain back on, resulted in the group stringing out and Bryan playing catch up. After a bit of climbing, it seemed he wasn’t catching the group, Gio, then myself eased off allowing him to regain contact with us, then a quick tow to Mark and David ahead. Sam and John had vanished into the distance, so the 5 of us got a train going , eventually catching them up at the roadside. We reformed the full group, hoping for an easy last 10 miles. 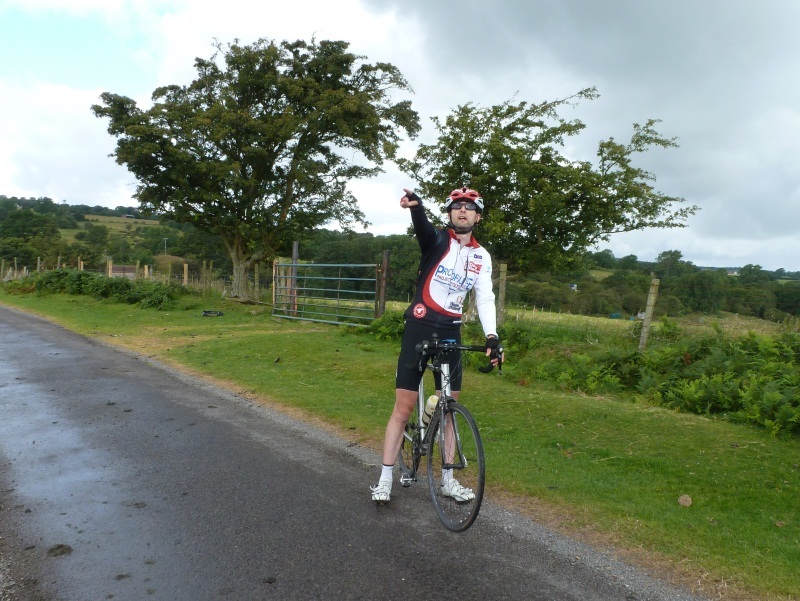 This hope was dashed, most of the remaining miles taking us up hill, passing the 100 mile mark (and David’s first century ride) before a final fast downhill into Okehampton. A last ‘where’s the accommodation?’ conflab – turned out it was just round the corner, up a ‘nice finish to your day’ bit of road according to a local. In other words, a hill. Not quite a killer, but did offer the opportunity to do a ‘Cav’ and childishly sprint by the rest of the team from the back for the first ‘stage win’. Day 1 in the bag. Lets see what tomorrow brings. up and at em at silly o’clock cos I couldn’t sleep – a mixture of nerves and excitement about the adventure (ordeal?) ahead of us. David came to mine, Bryan’s dad picked us up and kindly took us to the airport. We met the other 4 DIFD cyclists and slowly made our way to security where David was relieved of various toiletries not under the 100ml limit. An uneventful flight followed, but a harsh landing added a little excitement to proceedings. First time I’ve been in a plane landing at 15° roll. We piled into the minibus for our transfer down to Land’s End, stopping briefly at the services to grab lunch. An uneventful journey, with brief moments of gadgetry use as we checked email and tweeted a bit. Arriving at the hostel, it seemed we’d made a slight misjudgement, the owners on the understanding that we were not going to be there til 5pm. It was just after 3pm. Result – a walk to Lands End to meet up with Cameron and Mark Snr, Mark and David hopping back in the minibus for a lift to the nearby “Last Inn”. Our support met, a few photos taken and then return to the hostel, bikes unloaded and assembled and the lady owner phoned, soon then arriving to let us in for the inevitable fight over beds. The accommodation resolved, a short warm up/ bike check ride for 10 miles introduced us to our first Cornish Hill. A mere 17% incline. This ascent topped, we turned to get back to head out for dinner. The Last Inn, fine ale, decent pub fare, but a long wait to actually see the grub arrive. Home. Fireworks at Lands End in the distance and a check of email to see dozens of ‘justgiving’ donation alerts. 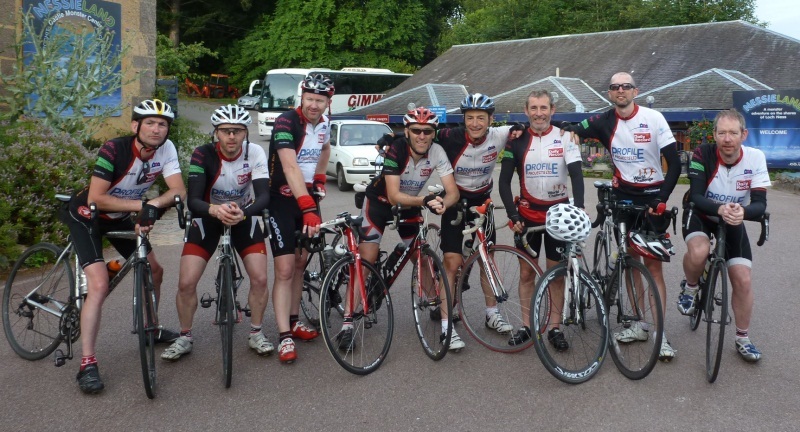 Much twittering of thanks, then a quick blog post before bed – a 6am start likely for our first acutal day on the bikes. Tuesday night is van packing night. Or it was yesterday. 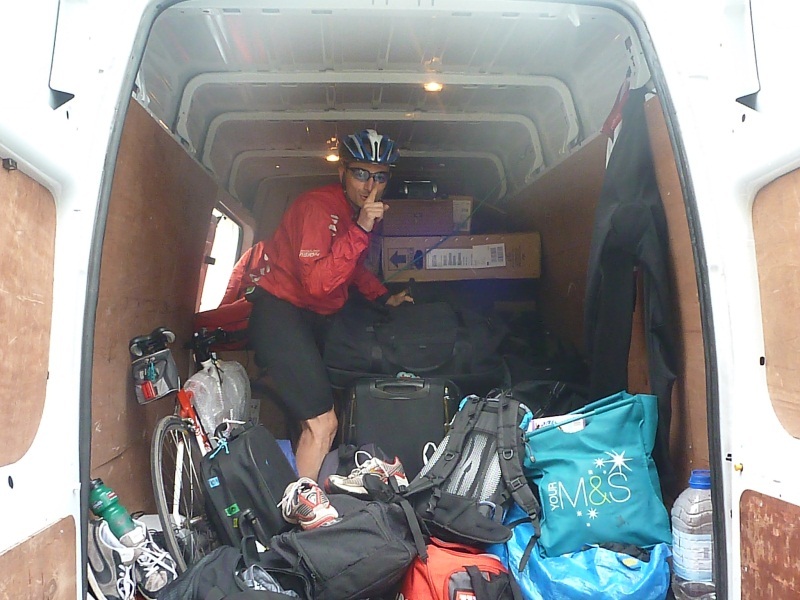 Wrestling pedals off their cranks, removing of handlebars (or not, as was the preference of some) followed by boxing of bicycles & their wheels, spare wheels and assorted stuff into the van – various spare parts, tools, our gear, a vast selection of energy food and (yes!) cakey (thank you Mrs Sammy!). And of course a Nespresso machine. Packing was followed by a curry, naturally. 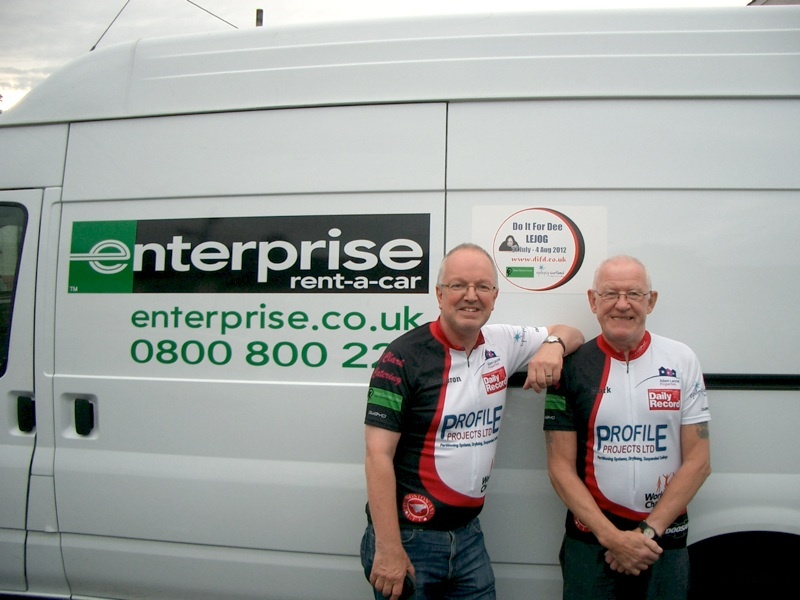 For two of us, this morning is day 1 of the LEJOG. The support crew of team DIFD, Cameron and Mark Snr should now be on their way south with the aforementioned van-load of stuff. 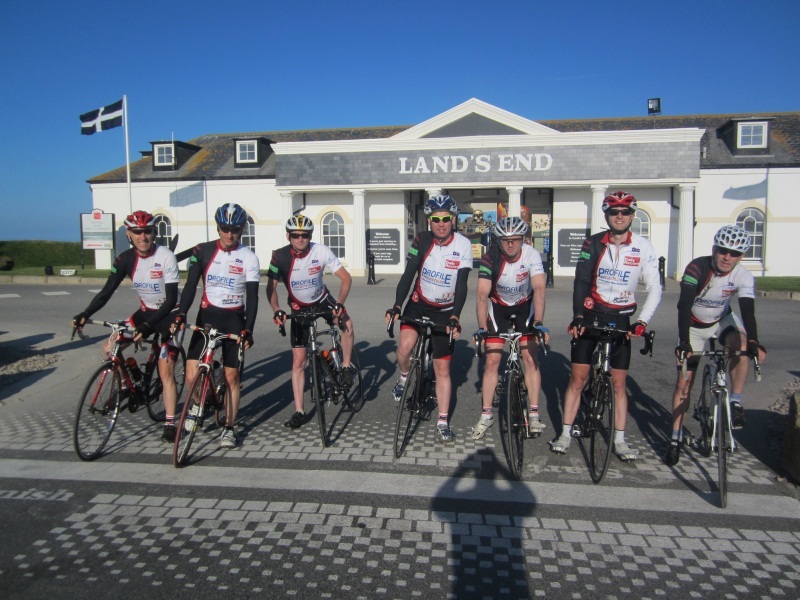 Ok, following on from our team cycle on Saturday (4/7, not quite the full team, but hey, its not bad this close to the ‘big day’ – blog post to follow) we’ve decided to up our fundraising target (again!) on justgiving.com to £15,000 – aiming high, but we are definitely making a difference with every extra pound we raise – I found out yesterday that we’re the top fundraiser for Brain Tumour Action and second for Epilepsy Scotland on justgiving – so many, many thanks again to those who have already donated. Only 4 days to go until we are on the road! Nice DIFD door magnets. 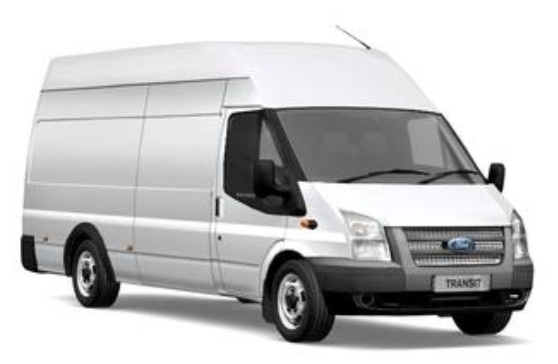 Now our hire van will be one of the gang sporting its very own version of the team kit. Awww. Wow! 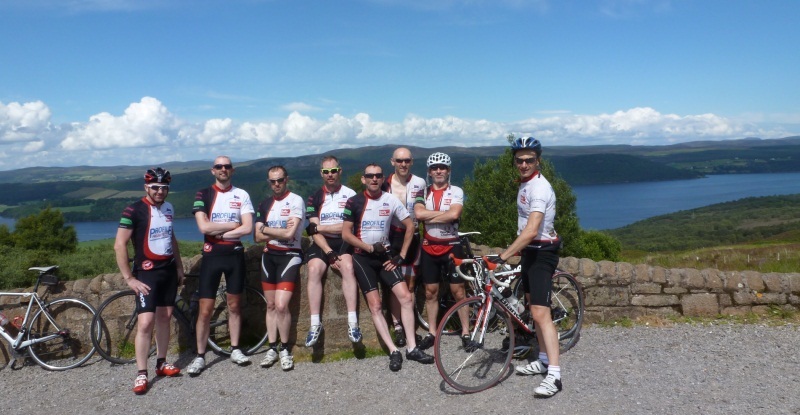 Today we exceeded our £10,000 fundraising target on justgiving.com, a week before we head off on the LEJOG cycle itself. We’re all amazed at the generosity shown by family, friends, neighbours, colleagues and even people we’ve met during training and events over the last several months. As we’ve not even begun the cycle (yet – 9 days to go! ), we’ve decided to up the target to £12,000. 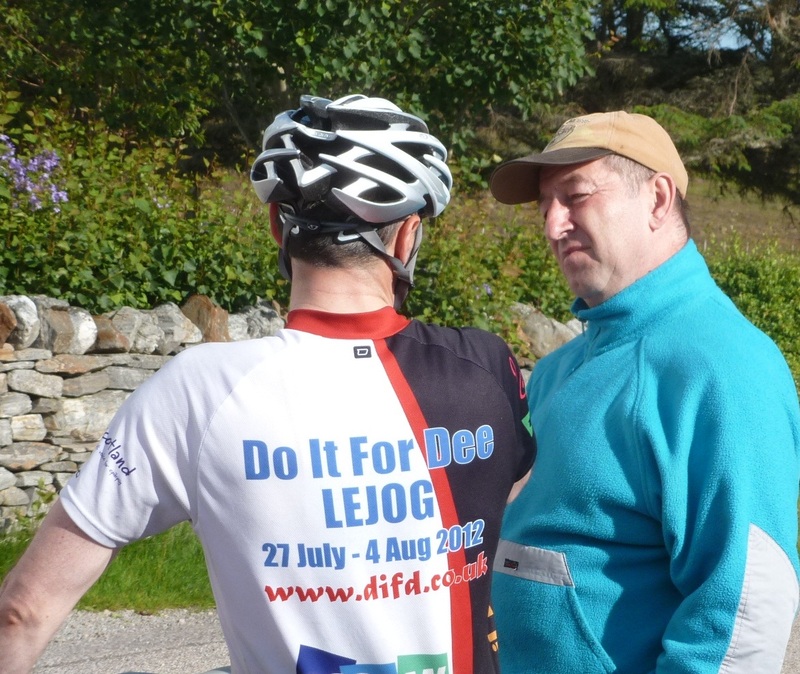 Knowing that every hill, each mile, all the hours we’ve put in throughout our training and soon the LEJOG itself has lead to such kind donations, makes it all worth it. Every little bit extra we raise will go towards helping those with epilepsy or brain tumours, as well as those around them. Both these conditions have such an impact on those who have them. I know our efforts and yours will make such a positive difference in their lives. 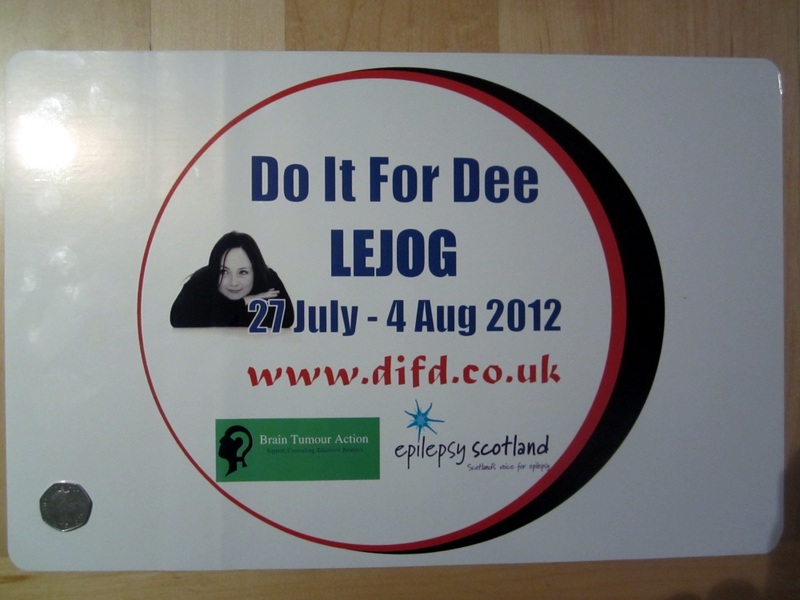 Thank you all for giving to the charities we chose to support in memory of Dee. A scenic run set up for last Saturday’s group ride. 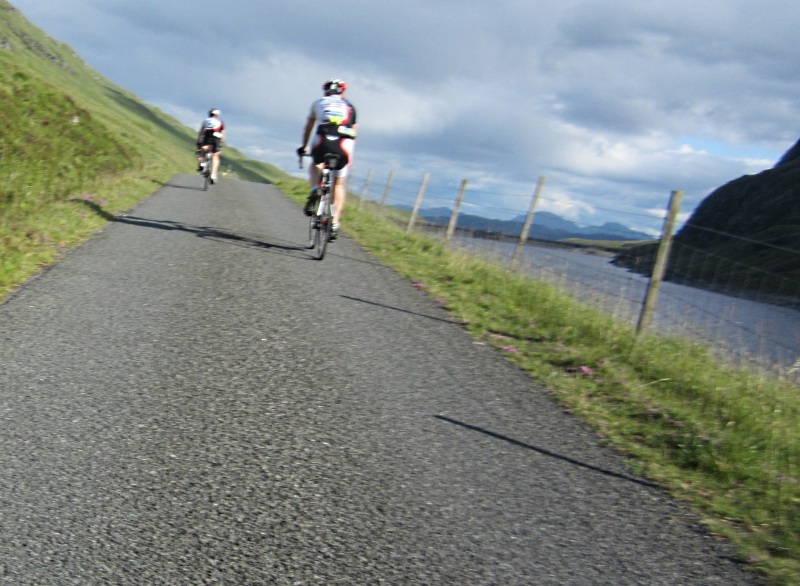 Start at Callander head to Killin and head up the valley and over to Glen Lyon. Then head up the hill to hill to Ben Lawers and back down and round Loch Tay to end up back at Killin and onwards to Callander. 77 miles with some good climbing involved. 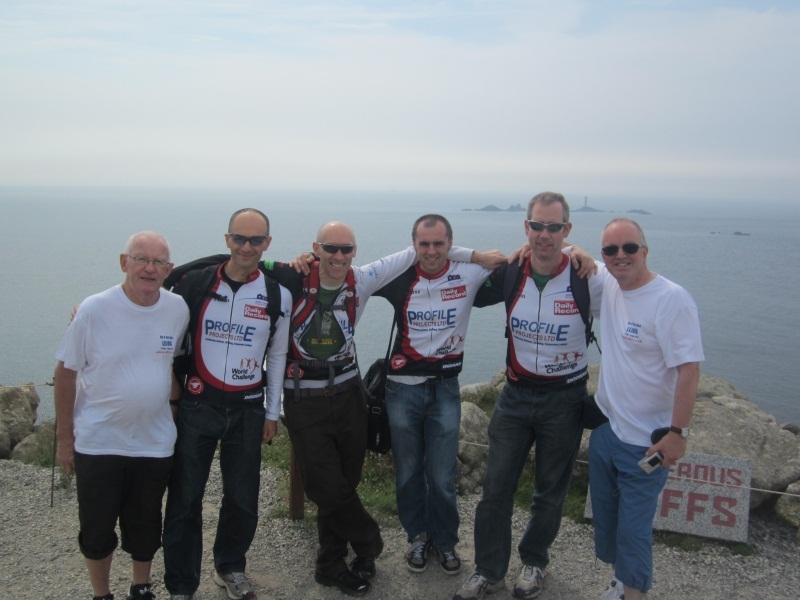 5 of the team were up for the route – only the G train and Young Davo missing. A 12.30 start seemed to suit most people so there you go. 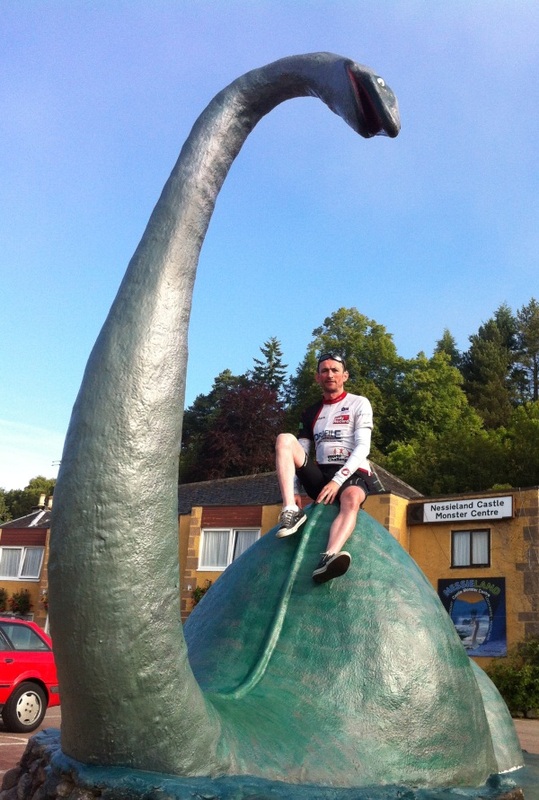 Of course, Sam then suggested cycling to Callendar as well. I couldn’t say no could I? So 77 miles becomes potentially 150. Strangely, nobody but Sam and I were up for the 150. Sam turned up in Renfrew only 15 minutes late – the earliest he’s been late in a long time, so we caught the intended Renfrew ferry boat ride to Yoker and headed on our way in earnest. A fairly smart 35 miles later we were in Callendar with 20 minutes to spare over the rest of the chaps – time for a toastie in a wee cafe. The rest of the gang rolled in for our 12.30 rendezvous at at 13.45 – the earliest Mark’s been late in a long time. So we start the 115 mile route (everyone was going to cycle all the way back except perhaps Tub, the driver) at 2 in the afternoon. Or is that the early evening. No matter, let’s ride. Some good bunch riding until Sammy got a flat. 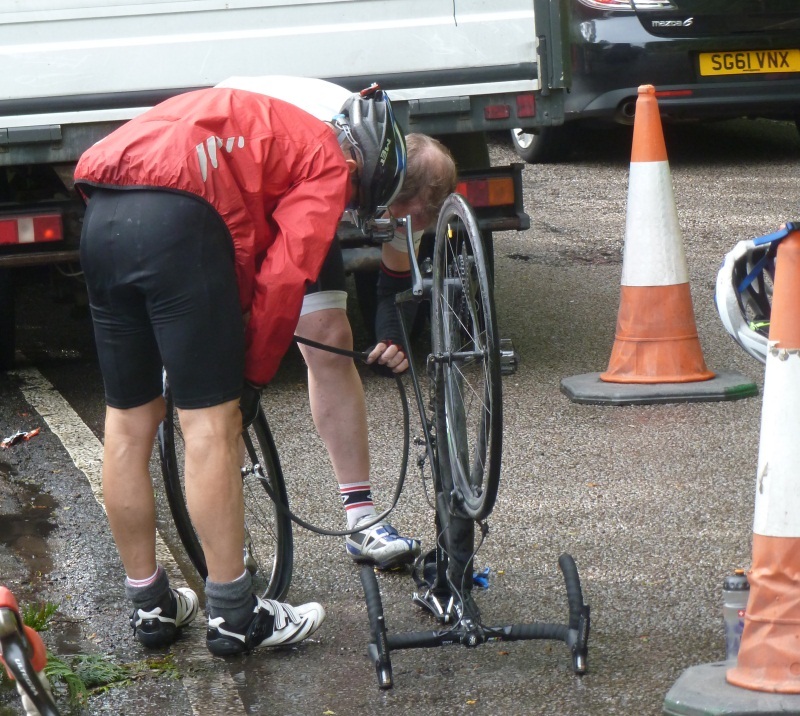 He took 10 minutes to ‘fix’ it – turned out he just put some air in it because it was a slow puncture. How long would he have taken to put a new tube in? And how long till we stopped for another air top-up? 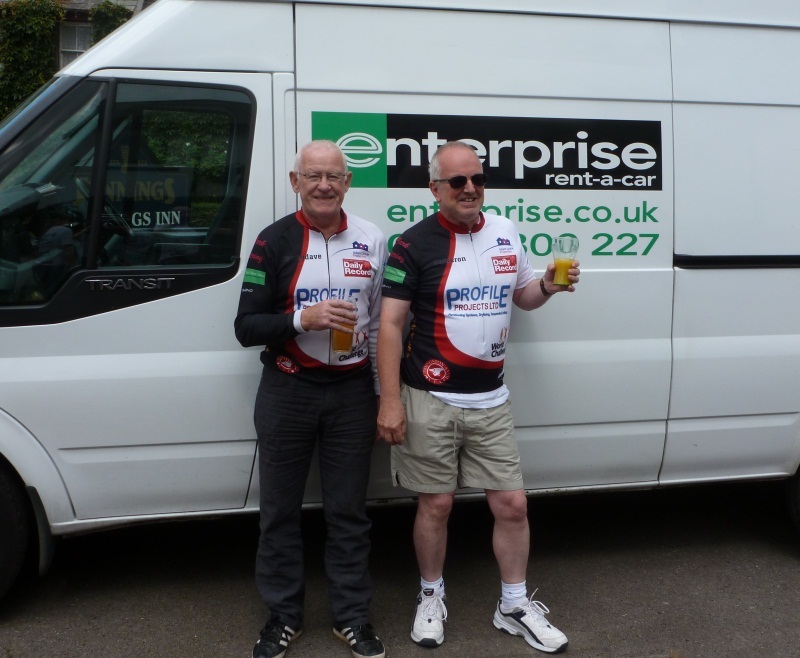 Memories of the Farce Whitton and Ian’s tyre troubles were fast being rekindled. Onwards to Killin. Ian called a stop to put jackets on. “It’s not worth it – it’s going to go off in a minute”. “Are you joking”? So jackets duly put on and another wee stop 5 minutes later – to take jackets off. 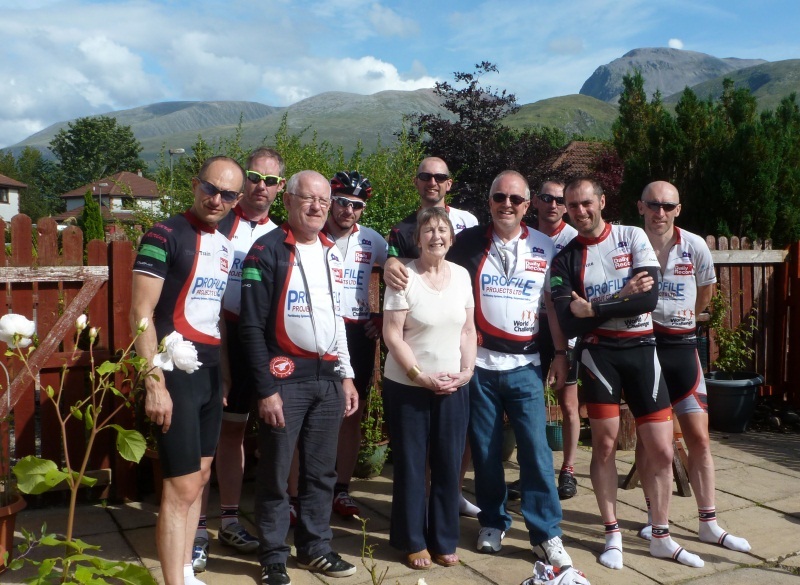 Another stop at the Waddell family cottage up the valley in Killin – Dalgirdy. No keys so can’t go in but at least mark has now clapped eyes on it, after claiming that he has never been invited to stay. Continue up the valley and up the steep, knackered road leading to Glen Lyon. Apparently, I overplayed the difficulty of this hill – 20% gradient is small potatoes to Sam. Of course, every time the gradient was up you had to veer al over the road to avoid the multitude of potholes and loose rocks everywhere – can’t be good for tyres surely? 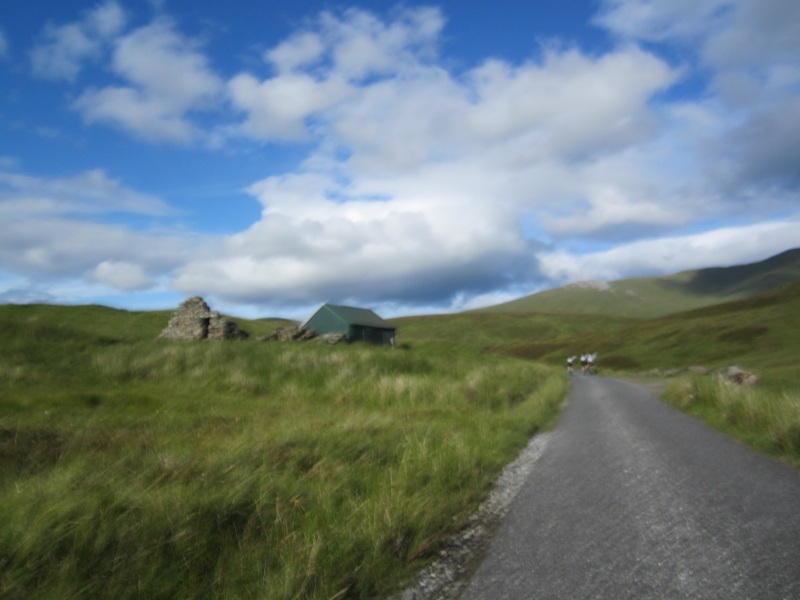 Down the hill and on to Glen Lyon – time to push the pace again, when boom – my tyre pretty much explodes going over a cattle grid. A quick change of tube – and kaboom! It positively explodes before putting it on the bike. At this point we realise that the tyre is ripped. We’re in doo-doo now. Stuck in no man’s land with no phone signal and and a dud tyre. As I am team leader, Tubs knows that he must give up his wheel to me – aye right. The best that happens is that Sam has a patch for tyre walls – does a reasonable job but a bit of a bulge is appearing so I’m restricted to approximately 20 psi instead of the usual 120. I can feel the rim as we go over cattle grids – not pleasant. 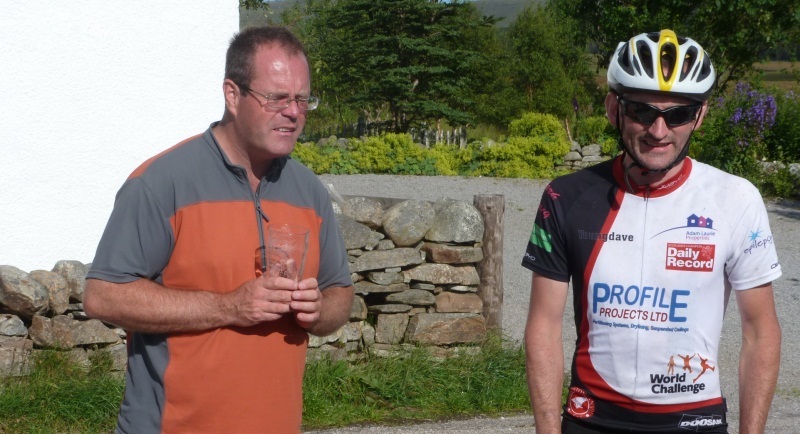 No matter – it’s holding up so I gingerly make my way along the road and up the hill to Ben Lawers with my trusty domestique Ian sitting beside me to make sure I’m ok. The rest have sailed into the distance over the hill. A slow descent from Ben Lawers and as we hit the road by Loch Tay I’m feeling a bit more confident to push the pace a little. 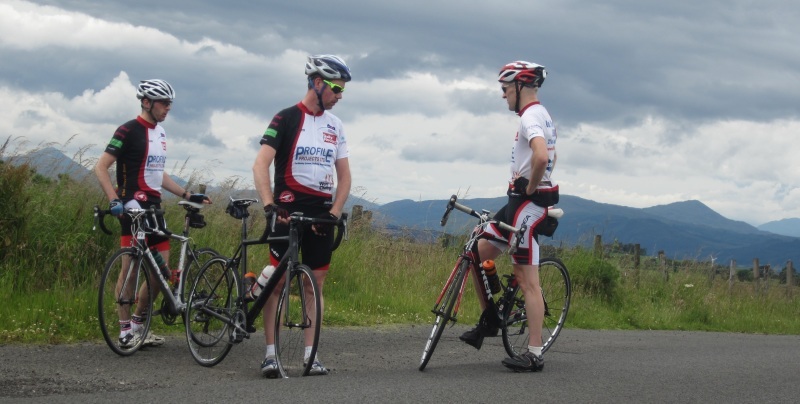 We’re going to have to – the 150 miler is never happening but the challenge now it so get back to Callendar and drive back to Cambuslang for a team meeting and curry sometime before midnight. Tubby feels strong so takes the fron for the last number of miles and we belt into Callendar at top testosterone-driven speed. However, the pace is a little too tidy for a weakening Sam. Normally at this point he takes a header off the bike into the gutter. 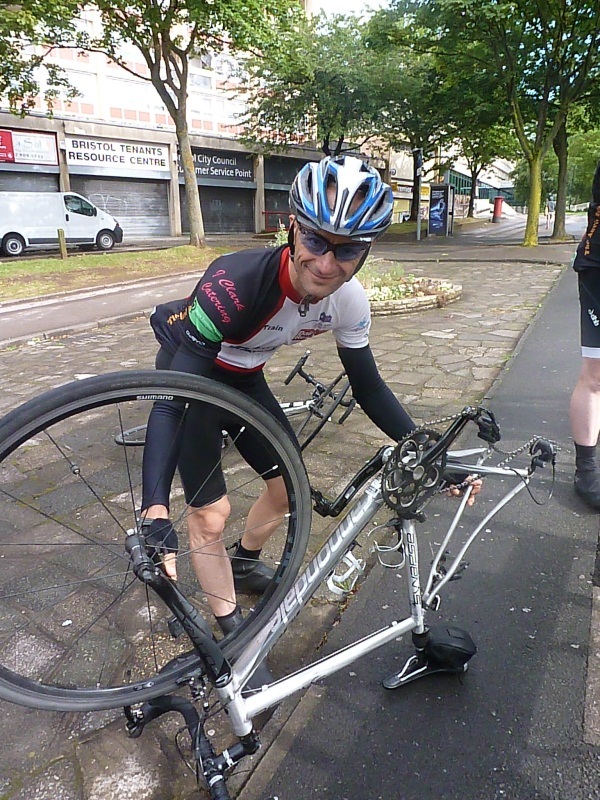 This time he plays more safe and stops for a ‘puncture’. 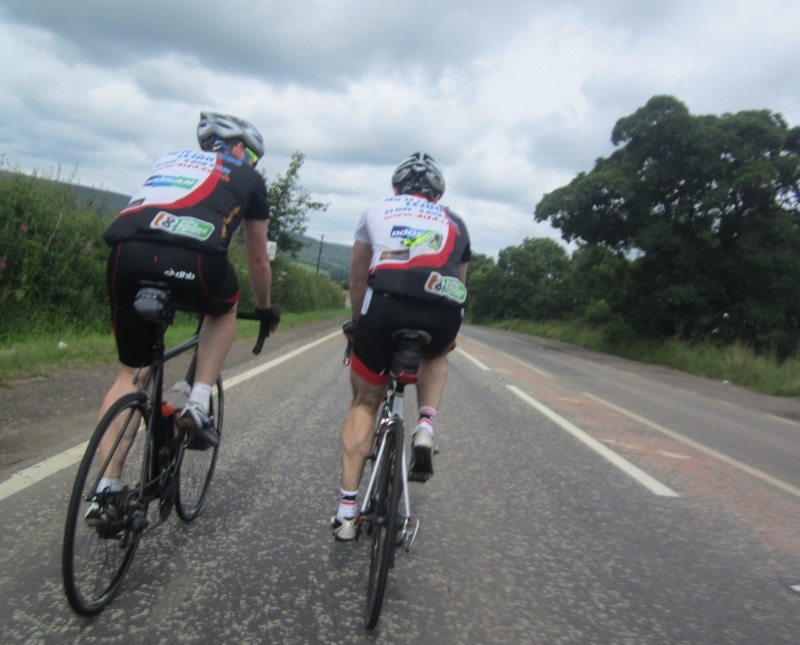 I stop along with Mark but Tubs and Ian don’t heard the call to stop – or strangely see that we have stopped (Tubs has looked round at least 200 times in the last 5 miles. Interesting). Of course, it’s a phantom puncture. So we try to get back up to pace and get some great drafting behind a motorhome, which unfortunately turns left a mile shy of where we need it. Back in Callandar, 5 bikes in/on the car, various wheels in people’s laps, and home James. Get into Cambuslang for a curry, Tubs sings Rhinestone Cowboy at the karaoke, the big meeting takes 5 seconds and back home. happy days. 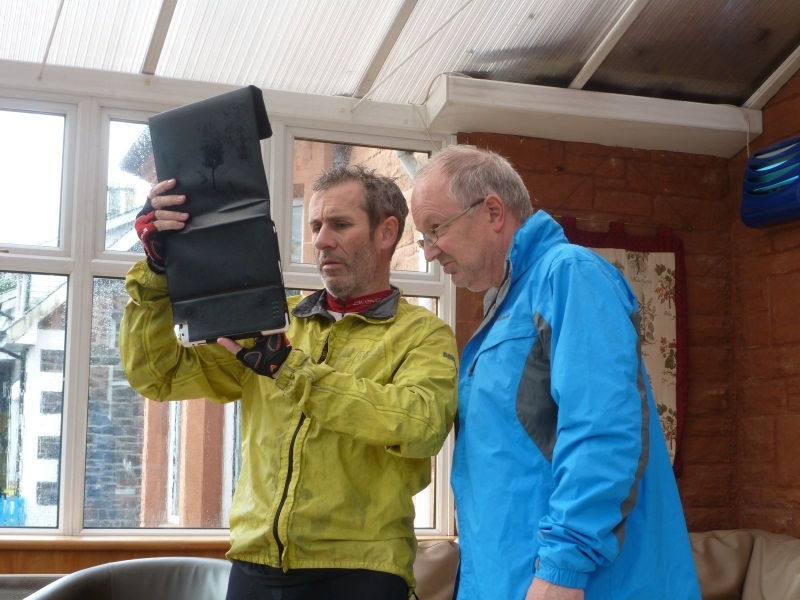 The big date for departure for LEJOG is fast looming. 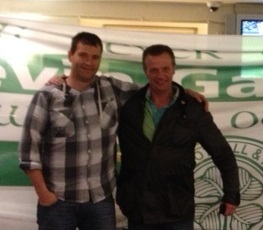 At last the serious questions are being asked as some of the chaps get their heads on for this momentous trip. 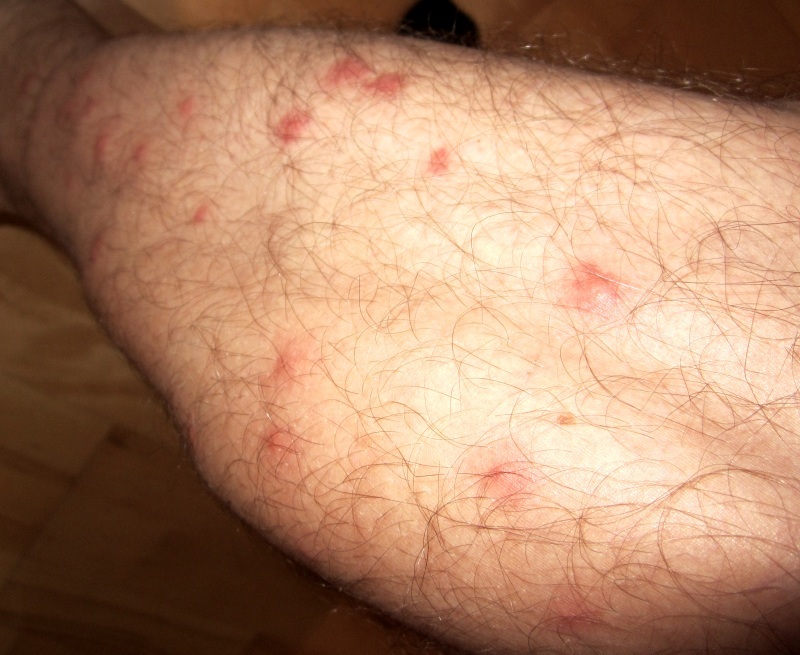 Questions that should have been asked a long time ago – are we getting our legs shaved or waxed? As a cyclist it is imperative to be hair free in the legs region. You save valuable time as you cut down on wind resistance and it makes it much easier to address cuts and scrapes if you come off the bike. Of course, these reasons are hogwash. The pros do it because, well, you just do it don’t you? Twas ever thus. The rest of us do it (except most of our crew have never done it) because the pros do it – and if it’s good enough for them etc. etc. So the real reasons why it is done are not completely clear. The one thing that can be said for sure is that is NOT done in any way out of vanity. No way. No one is doing it thinking “gosh, don’t my legs look good? Aren’t my muscles well defined? Don’t they feel lovely and smooth”? 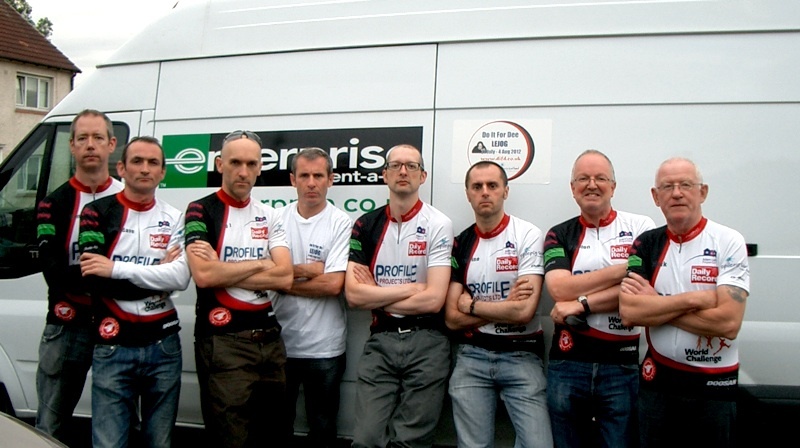 Anyway, our LEJOG crew have decided to go hair-free. All for one and one for all. We are now at the stage of contemplating exactly how that process should be carried out. Wax, shave, hair removal cream? We shall see. Young Mark has a bit of form in the hair free game. He’s an ironman, don’t ya know and all ironmen are hair free. Mark has suggested the hair removal cream route, which is what he does. Apparently, he’s a little stubbly at the moment but will address that soon. I spoke to him yesterday and he said that he doesn’t actually like shaved legs. Interestingly, he still shaves, although he also let it be known that he thought the stated reasons for shaving mentioned previously were hogwash. And still he shaves. Interesting indeed. Gio is not convinced by the cream method. he has in the past shaved – only once mind. I loved his quote that he out in an email, “I will admit that 10yrs ago I did shave (was serious about beach volley in Cali-don’t make me say more)”. SERIOUS ABOUT BEACH VOLLEY BALL???? Mull that one over. Anyway, the G trains legs are looking seriously developed. Yes, I look – and admire. Consequently, when the waxing issue was broached, he jumped all over the idea – and then said “of course, I’m not bothered but in the interests of team harmony I’d be happy to go along with what you agree). Personally, I think he’s for waxing. Turbine was told by Mrs T under no circumstances was he to wax – he would not be able to stand the pain. Which is a pity as he seriously fancied the full b, s and c. Turbine has his power calves to show off. He’s mustard keen to ‘get em off’ hair-wise. Ian, Young Davo and Sammy are not saying much on the issue although Ian seems ready to lay himself at the mercy of the ladies at his work. £10 a strip towards the charities? Waxing, shaving, cream. I decided to take one for the team – and used the cream. The results are shown below. As I write this, this is the current state of play. The water is the shower is too cold to contemplate the 2nd leg. So I’m going to go out now for a run and see if my right leg runs faster than the left. At least I know I will be fast as I don’t want anyone seeing me in hairy/smooth transition stage. Click the pic to see the full glory. Hope you’ve not just eaten. So. Wax, shaving, cream or au natural. What do you think? Comments please.